Cellular networks are intrinsically subject to stochastic fluctuations, but analysis of the resulting noise remained largely limited to gene expression. The pathway controlling chemotaxis of Escherichia coli provides one example where posttranslational signaling noise has been deduced from cellular behavior. This noise was proposed to result from stochasticity in chemoreceptor methylation, and it is believed to enhance environment exploration by bacteria. Here we combined single-cell FRET measurements with analysis based on the fluctuation-dissipation theorem (FDT) to characterize origins of activity fluctuations within the chemotaxis pathway. We observed surprisingly large methylation-independent thermal fluctuations of receptor activity, which contribute to noise comparably to the energy-consuming methylation dynamics. 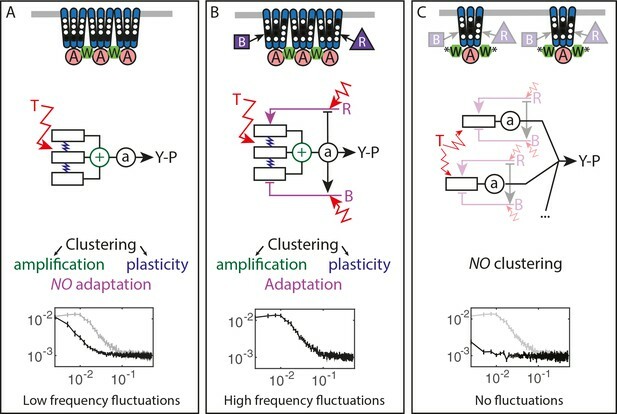 Interactions between clustered receptors involved in amplification of chemotactic signals are also necessary to produce the observed large activity fluctuations. Our work thus shows that the high response sensitivity of this cellular pathway also increases its susceptibility to noise, from thermal and out-of-equilibrium processes. It is well established that cellular processes are intrinsically stochastic and therefore prone to fluctuations (ten Wolde et al., 2016; Rao et al., 2002; Tsimring, 2014). The best-characterized examples of cellular noise relate to the variability in expression of genes or proteins, observed either across a population of genetically identical cells or within one cell over time (Raj and van Oudenaarden, 2008; Elowitz et al., 2002). The molecular origins and physiological effects of such expression noise are comparatively well understood (Rao et al., 2002; Tsimring, 2014; Raj and van Oudenaarden, 2008; Paulsson, 2004; Balázsi et al., 2011; Eldar and Elowitz, 2010). In contrast, noise that arises in cellular networks at the posttranslational level remains much less characterized. Although such noise is expected to be ubiquitous, for example, in signaling networks, it was mostly observed indirectly through its effects on gene expression or cell behavior (ten Wolde et al., 2016; Tsimring, 2014). Chemotaxis of Escherichia coli, a bacterial model for signal transduction, previously provided one example where signaling noise has been predicted based on analyses of cell motility and flagellar rotation (Korobkova et al., 2004; Emonet and Cluzel, 2008; Berg and Brown, 1972; Dufour et al., 2016; Spudich and Koshland, 1976; Park et al., 2010; He et al., 2016). E. coli swims by a succession of straight runs during which the bacterium advances, that are interrupted by short reorientations, or tumbles, which results in a random walk. In chemical gradients, this random walk becomes biased by lengthening the runs towards more favorable conditions. The chemotaxis pathway controlling this behavior is composed of two modules, one mediating signal transduction and another adaptation, that operate on different time scales (Parkinson et al., 2015; Colin and Sourjik, 2017; Shimizu et al., 2010) (Figure 1—figure supplement 1A). The signal transduction module includes sensory complexes consisting of the dimers of transmembrane receptors, the kinase CheA and the scaffold protein CheW. Signaling by these complexes can be understood in terms of a two-state model: In the absence of stimulation, receptor dimers are at equilibrium between the active (ON) and inactive (OFF) states, resulting in an intermediate level of autophosphorylation activity of the receptor-associated CheA. Positive chemotactic stimuli (attractants) shift the equilibrium towards the OFF state, thus inhibiting CheA, whereas repellent stimulation has the opposite effect. Downstream signal transduction occurs via phosphorylation of the response regulator CheY that can subsequently bind to the flagellar motors to induce tumbles. CheY is dephosphorylated with the help of the phosphatase CheZ. All reactions within the signal transduction module occur within a few hundred milliseconds (Sourjik and Berg, 2002a), ensuring that swimming bacteria can faithfully monitor their current local environment. The adaptation module operates on a much longer time scale of seconds to minutes. It includes two enzymes, the methyltransferase CheR and the methylesterase CheB, which add or remove respectively methyl groups at four specific glutamyl residues of the chemoreceptors. Since receptor methylation increases the activity of the chemosensory complexes, these changes gradually compensate for the effects of both attractant and repellent stimulation via a negative feedback loop (Barkai and Leibler, 1997; Hansen et al., 2008; Tu et al., 2008). This enables bacteria to robustly maintain an intermediate steady-state activity of CheA, and thus the level of CheY phosphorylation and frequency of cell tumbles, even in the presence of steady background stimulation. Notably, in both major E. coli chemoreceptors Tar and Tsr, two of the four methylated residues are initially encoded as glutamines, for example Tar is expressed as TarQEQE. Glutamines are functionally similar to methylated glutamates (Dunten and Koshland, 1991; Sourjik and Berg, 2004; Li and Weis, 2000; Endres et al., 2008), and they are subsequently deamidated to glutamates by CheB (Rice and Dahlquist, 1991; Kehry et al., 1983). Despite this importance of the adaptation system for robust maintenance of the average signaling output, it was suggested that the relatively small number of methylation enzymes (Li and Hazelbauer, 2004) and their slow exchange rates at their receptor substrates (Li and Hazelbauer, 2005; Schulmeister et al., 2008) lead to fluctuations of the level of phosphorylated CheY (Korobkova et al., 2004; Emonet and Cluzel, 2008; Dufour et al., 2016; Tu and Grinstein, 2005; Pontius et al., 2013). Further amplified by the cooperative response of the flagellar motor (Tu and Grinstein, 2005; Cluzel et al., 2000), these fluctuations were proposed to explain the observed large variation in the motor rotation (Korobkova et al., 2004; Emonet and Cluzel, 2008; He et al., 2016) and in the swimming behavior (Korobkova et al., 2004; Berg and Brown, 1972; Spudich and Koshland, 1976; Taute et al., 2015) of individual cells over time. Subsequent theoretical analyses suggested that such behavioral fluctuations might provide physiological benefit, by enhancing environmental exploration (Emonet and Cluzel, 2008; Viswanathan et al., 1999; Matthäus et al., 2009; Bénichou et al., 2011; Matthäus et al., 2011; Flores et al., 2012). Another distinctive feature of the bacterial chemotaxis pathway is the clustering of chemoreceptors in large signaling arrays, formed through a complex network of interactions between trimers of receptor dimers, CheA and CheW (Parkinson et al., 2015). Although signaling arrays are stable on the time scale of signal transduction (Schulmeister et al., 2008; Gegner et al., 1992), they appear to locally reorganize within minutes (Frank and Vaknin, 2013). Within arrays, the activity states of neighboring receptors are coupled, resulting in amplification and integration of chemotactic signals (Sourjik and Berg, 2004; Li and Weis, 2000; Tu, 2013; Piñas et al., 2016; Duke and Bray, 1999; Mello and Tu, 2003; Monod et al., 1965; Keymer et al., 2006). These allosteric receptor interactions have been previously described using either the Monod-Wyman-Changeux (MWC) model (Monod et al., 1965) which assumes that receptors operate in units (signaling teams) of 10–20 dimers where activities of individual receptors are tightly coupled (Sourjik and Berg, 2004; Mello and Tu, 2003; Monod et al., 1965; Keymer et al., 2006; Mello and Tu, 2005) or using an Ising model of a receptor lattice with intermediate coupling (Duke and Bray, 1999; Mello and Tu, 2003). In both models, the sensitivity of signaling arrays is highest at intermediate levels of receptor activity where receptors can easily switch between ON and OFF states, with optimal intermediate activity being maintained by the adaptation system (Tu, 2013; Piñas et al., 2016). Another connection between the adaptation system and receptor clustering is through adaptation assistance neighborhoods, where adaptation enzymes that are transiently tethered to one receptor molecule can methylate (or demethylate) multiple neighboring receptors (Li and Hazelbauer, 2005). 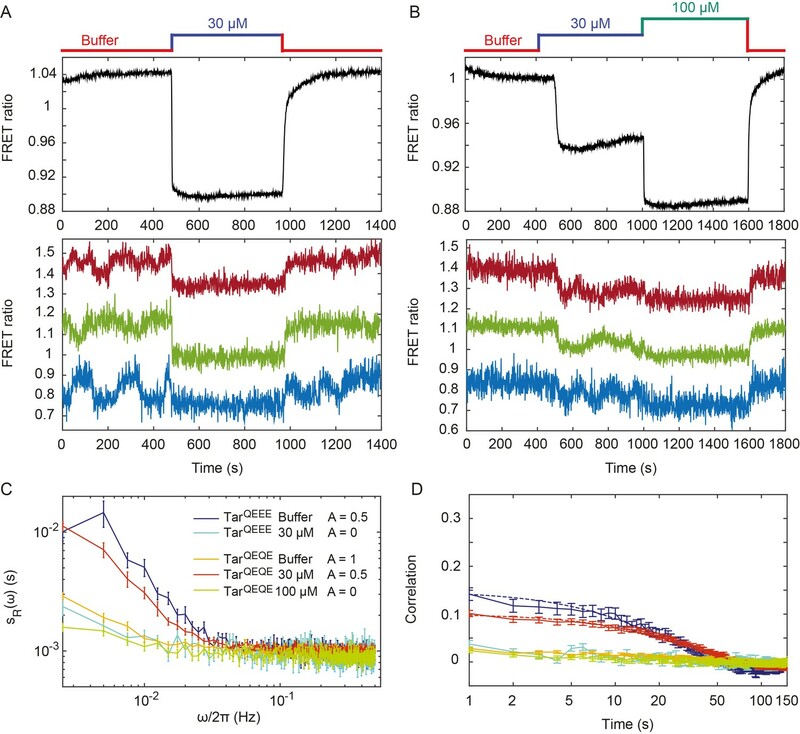 In this work we directly quantify signaling noise in E. coli chemotaxis, using Förster (fluorescence) resonance energy transfer (FRET) to monitor pathway activity in single cells and with high time resolution. We show that the pathway activity fluctuations arise from interplay of multiple factors, including not only the stochasticity of the methylation system but also cooperative interactions and slow rearrangements of receptors within clusters. Finally, using analysis based on the fluctuation-dissipation theorem (FDT) we could distinguish between equilibrium and out-of-equilibrium fluctuations within the chemotaxis network and elucidate respective contributions of receptor clusters and methylation to the overall noise. To perform time-resolved measurements of the chemotaxis pathway activity in individual E. coli cells, we adapted the microscopy-based ratiometric FRET assay (Sourjik et al., 2007) that relies on the phosphorylation-dependent interaction between CheY, fused to yellow fluorescent protein (CheY-YFP), and its phosphatase CheZ, fused to cyan fluorescent protein (CheZ-CFP) (Figure 1—figure supplement 1A). The amount of this complex, and thus the level of FRET, provides a direct intracellular readout of CheA activity (Endres et al., 2008; Sourjik et al., 2007; Sourjik and Berg, 2002b; Oleksiuk et al., 2011). In previous studies where this assay was applied to investigate chemotactic signaling in E. coli populations (Shimizu et al., 2010; Sourjik and Berg, 2004; Endres et al., 2008; Frank and Vaknin, 2013; Piñas et al., 2016; Sourjik et al., 2007; Sourjik and Berg, 2002b; Oleksiuk et al., 2011; Neumann et al., 2014a; Krembel et al., 2015a; Meir et al., 2010; Frank et al., 2016; Krembel et al., 2015b; Neumann et al., 2014b; Neumann et al., 2012; Clausznitzer et al., 2010), bacteria expressing the FRET pair were immobilized in a flow chamber and fluorescent signals were collected using photon counters from an area containing several hundred cells (Sourjik et al., 2007). Here, we used a similar setup but instead imaged fluorescence of the FRET pair with an electron multiplication charge-coupled device (EM-CCD) camera (see Materials and methods and Figure 1—figure supplement 1B,C). As done previously (Sourjik and Berg, 2004; Endres et al., 2008; Oleksiuk et al., 2011; Meir et al., 2010), we analyzed E. coli cells that express the CheY-YFP/CheZ-CFP FRET pair instead of the native CheY and CheZ and have Tar as the only chemoreceptor (see Materials and methods). The level of Tar expression in these cells and under our conditions is ~104 dimers per cell (Sourjik and Berg, 2004; Endres et al., 2008), comparable to the total level of endogenous chemoreceptors (Li and Hazelbauer, 2004). When integrated over the population, the chemotactic response of these cells measured using EM-CCD (Figure 1A and Figure 1—figure supplement 2, upper panel) was very similar to the one observed previously using area detectors (Sourjik and Berg, 2002b; Meir et al., 2010). When bacteria in the flow chamber were stimulated with the Tar-specific chemoattractant α-methyl-DL-aspartate (MeAsp), the ratio of the YFP to CFP fluorescence (FRET ratio, Rt=YFPt/CFPt) first rapidly decreased. This is consistent with the fast attractant-mediated inhibition of the kinase activity, which results in decreased formation of the FRET complex, and therefore reduced energy transfer from the donor (CFP) to the acceptor (YFP) fluorophore. As 10 µM MeAsp is known to fully inhibit the kinase activity in this strain (Sourjik and Berg, 2004; Endres et al., 2008), the value of the FRET ratio immediately after stimulation reflects the zero activity baseline. Subsequently, the pathway adapted to the new background level of attractant via the CheR-dependent increase in receptor methylation. But as previously reported adaptation of Tar-only cells to high levels of MeAsp was only partial (Neumann et al., 2014a; Krembel et al., 2015a; Meir et al., 2010), meaning that the adapted pathway activity remained lower than in buffer. Subsequent removal of attractant resulted in a transient increase in kinase activity, followed by the CheB-mediated adaptation through the demethylation of receptors. Fluctuations of the chemotaxis pathway activity in individual CheR+CheB+ cells. (A) Time course of the FRET measurements for the CheR+ CheB+ strain expressing the FRET pair CheY-YFP and CheZ-CFP and Tar as the sole receptor (see Materials and methods for details of expression), for cell population (upper panel) and for representative single cells (lower panel). Cells immobilized in a flow chamber under steady flow (see Materials and methods and Figure 1—figure supplement 1B) were initially adapted in buffer (red) and subsequently stimulated by addition and subsequent removal of indicated concentrations of a non-metabolizable chemoattractant MeAsp (blue and green). The measurement traces for single cells have been shifted along the y-axis to facilitate visualization. (B) Power spectral density (PSD) of the FRET ratio for single cells adapted in buffer (red curve) or in 10 µM MeAsp (blue curve), as well as for the control receptorless strain in buffer (black curve). (C) The corresponding time autocorrelation functions of the single-cell FRET ratio. Dashed lines show fits by exponential decay (see Materials and methods). The error bars represent standard errors of the mean (SEM), and the sample sizes are 265 (buffer), 69 (10 µM) and 103 (receptorless control) single cells coming from at least three independent experiments in each case. Although the FRET ratio measured for individual cells during the same experiment was expectedly noisier than the population-averaged data, both the initial response and subsequent adaptation were clearly distinguishable (Figure 1A and Figure 1—figure supplement 2, lower panel). In contrast to the population measurement, however, a majority of individual cells also exhibited large fluctuations in the FRET ratio on the time scale of 10–100 s. For cells adapted in buffer, the amplitude of these fluctuations could be as large as the response to strong attractant stimulus. Confirming that this low-frequency noise reflects fluctuations of the pathway activity, it was not observed when imaging either fluorescent beads or the same FRET pair in receptorless cells that do not activate CheA (Figure 1—figure supplement 3A,B). Furthermore, inhibition of the pathway activity by saturating stimulation with 10 µM or 25 µM MeAsp also transiently suppressed long-term fluctuations, which subsequently (partly) reappeared upon (partial) recovery of the pathway activity due to adaptation (Figure 1A and Figure 1—figure supplement 2). In contrast, the higher-frequency noise in the FRET ratio could be observed in all strains and conditions, including receptorless cells, indicating that it represents the noise of the measurement. High-frequency noise was also observed in the control measurements using fluorescent beads, although its magnitude was lower, consistent with higher brightness of beads compared to the YFP/CFP expressing cells. To analyze these activity fluctuations in greater detail, we computed the power spectral density (PSD) of the single-cell FRET ratio, sRω (see Materials and methods). The PSD extracts the average spectral content of the temporal variations of the single-cell FRET ratio, that is determines the frequencies at which this ratio fluctuates, with sRω representing the magnitude of fluctuations at a given frequency ω. We observed that at high frequency (ω > 0.1 Hz) the PSD kept a constant frequency-independent low value that was similar in all strains (Figure 1B). We thus conclude that the noise in the FRET ratio in this frequency range is dominated by the shot noise of the measurement. At lower frequency, however, the PSD measured for the Tar-expressing cells adapted in buffer increased dramatically (roughly as 1/ω), reaching a low frequency plateau at ω/2π≃0.015 Hz. A similar result was obtained for cells expressing Tar in the unmodified (TarEEEE) state, where all glutamates are directly available for methylation by CheR (Figure 1—figure supplement 4A). The increase of the PSD at low frequency was also observed for cells adapted to either 10 or 25 µM MeAsp (Figure 1B and Figure 1—figure supplement 4A), although the amplitude of this increase was smaller than for the buffer-adapted cells, apparently consistent with their lower pathway activity (Figure 1A and Figure 1—figure supplement 2). The receptorless strain showed nearly constant noise level over the entire frequency range, as expected for white shot noise, although the PSD increased weakly at the lowest frequency. As such increase was not observed for the control using fluorescent beads (Figure 1—figure supplement 3A), it might be due to the slow drift of the FRET ratio arising as a consequence of the slightly different bleaching rates of CFP and YFP, but possibly also to slow changes in cell physiology. In any case, the contribution of this low-frequency component to the overall PSD of the Tar-expressing cells is only marginal (note the log scale in Figure 1B), and subtracting it did not markedly change our results (Figure 1—figure supplement 5). The PSD was further used to calculate the average time autocorrelation function of the single-cell FRET ratio, which reflects the characteristic time scale of activity fluctuations (see Materials and methods). For cells adapted in buffer, the autocorrelation time constant was 9.5 ± 0.5 s, as determined by an exponential fit to the autocorrelation function (Figure 1D). This value is similar to the characteristic time of the pathway activity fluctuation previously deduced from behavioral studies (Korobkova et al., 2004; Park et al., 2010). The same characteristic time was observed in MeAsp-adapted cells, although the amplitude of the correlation was considerably smaller in this case (Figure 1D and Figure 1—figure supplement 4B). Interestingly, at longer times the autocorrelation function becomes weakly negative, indicating an overshoot that is likely caused by the negative feedback in the adaptation system (Berg and Tedesco, 1975). As expected, no autocorrelation was observed for the receptorless cells. Finally, the variance of activity was evaluated from the PSD using Parseval’s formula (Gasquet and Witomski, 1999). After subtracting the variance measured for the receptorless strain, which reflects the contribution of the shot noise, the specific variance of the FRET ratio for cells adapted in buffer was ⟨ΔR2⟩+ = 0.0046± 0.0002 (where ‘+' refers to the presence of adaptation enzymes, CheR+ CheB+). As shown previously (Sourjik et al., 2007), the FRET ratio R is related to the relative pathway activity A as R =λ A +μ, where λ is the conversion factor and µ is a constant corresponding to the baseline FRET ratio at zero pathway activity (i.e., upon stimulation with saturating attractant concentration; Figure 1A). The value λ=0.10±0.01 could be estimated as the mean difference between the measured FRET ratio values corresponding to the fully active (i.e., A=1) and fully inactive (i.e., A=0) pathway (see Materials and methods). The calculated variance of the pathway activity was thus ΔA2+ = 0.46± 0.04, indicating concerted activity fluctuations across much of the signaling array. We next monitored the single-cell pathway activity in a strain lacking CheR and CheB, to test whether the observed fluctuations could be solely explained by the action of the adaptation system. Given the observed dependence of the fluctuations on the level of pathway activity, we first analyzed a ΔcheRΔcheB strain that was engineered to express Tar receptor in one-modified state (TarQEEE). This closely mimics the average modification state and intermediate activity of Tar in CheR+ CheB+ cells adapted in buffer (Endres et al., 2008; Sourjik and Berg, 2002b). Expectedly, ΔcheRΔcheB TarQEEE cells responded to MeAsp but showed no adaptation comparable to CheR+ CheB+ cells (Figure 2A). But despite the lack of the adaptation system, pathway activity in individual ΔcheRΔcheB TarQEEE cells showed pronounced long-term fluctuations when cells were equilibrated in buffer (Figure 2A, lower panel). These methylation-independent long-term fluctuations were suppressed upon saturating pathway inhibition with 30 µM MeAsp, leaving only the shot noise of the measurement. Pathway activity fluctuations in ΔcheRΔcheB cells. (A) Time course of population-averaged (black; upper panel) and typical single-cell (colors; lower panel) measurements of the FRET ratio for ΔcheRΔcheB strain expressing TarQEEE as the sole receptor. Measurements were performed as in Figure 1. Cells were first equilibrated in buffer (red) and subsequently stimulated by addition (blue) and subsequent removal of 30 µM MeAsp, saturating stimulus for this receptor. (B) Same as (A) but for ΔcheRΔcheB strain expressing TarQEQE as the sole receptor and upon stimulation with 30 µM (blue) and then 100 µM (green) MeAsp. Note that for this receptor, 30 µM MeAsp is the sub-saturating stimulus whereas 100 µM MeAsp is the saturating stimulus. The measurement traces for single cells in (A) and (B) have been shifted along the y-axis to facilitate visualization. (C) PSD of the single-cell FRET ratio for TarQEEE in buffer (blue) or in 30 µM MeAsp (cyan), TarQEQE in buffer (orange), in 30 µM MeAsp (red) or in 100 µM MeAsp (green). (D) Corresponding time autocorrelation functions of the single-cell FRET ratio for indicated strains/conditions. Dashed lines show fits by single exponential decay. Error bars represent standard errors of the mean (SEM), and the sample sizes are 153 (TarQEEE, buffer), 65 (TarQEEE, 30 µM), 471 (TarQEQE, buffer), 404 (TarQEQE, 30 µM) and 136 (TarQEQE, 100 µM) single cells coming from at least three independent experiments in each case. In contrast to TarQEEE, ΔcheRΔcheB cells expressing the half-modified TarQEQE as the sole receptor showed no long-term activity fluctuations in buffer (Figure 2B). Because TarQEQE is known to be highly active (i.e., strongly biased towards the ON state) in absence of attractants (Endres et al., 2008; Oleksiuk et al., 2011) and therefore insensitive to stimulation, we lowered its activity to an intermediate value by stimulating cells with 30 µM MeAsp (Figure 2B, upper panel). This partial stimulation indeed restored low-frequency fluctuations in ΔcheRΔcheB TarQEQE cells (Figure 2B, lower panel). Again, these activity fluctuations were completely abolished upon saturating attractant stimulation. Cumulatively, these results clearly demonstrate that, at intermediate level of activity where the receptors are highly sensitive, pathway output fluctuates even in the absence of the methylation system. These fluctuations were clearly identifiable above shot noise in the PSD of the FRET ratio (Figure 2C), and they were absent under conditions of very low or very high activity. Notably, these methylation-independent fluctuations were slower than those observed in CheR+ CheB+ cells (Figure 2—figure supplement 2), with a typical time scale of 34 ± 4 s, as determined by fitting the time autocorrelation functions with an exponential decay (Figure 2D), although this time might be slightly under-evaluated since it is already comparable to the total duration of acquisition (400 s). Their amplitude, evaluated again using Parseval’s formula, was ΔR2-=0.0025± 0.0001, corresponding to ΔA2- = 0.25± 0.01, and thus roughly half of the amplitude of fluctuations observed in CheR+ CheB+ cells. To investigate whether the observed fluctuations depend on clustering of chemotaxis receptors, we utilized a recently described CheW-X2 version of the adaptor protein CheW that disrupts formation of the receptor arrays without abolishing signaling (Frank et al., 2016). This CheW mutant carries two amino acid replacements, R117D and F122S, which are believed to break the receptor arrays into smaller complexes consisting of two trimers of receptor dimers coupled to one CheA (Piñas et al., 2016; Frank et al., 2016). The CheW-X2 is expressed at a level similar to the native CheW (Piñas et al., 2016). Consistent with reported functionality of such complexes (Piñas et al., 2016; Frank et al., 2016; Li and Hazelbauer, 2014), a ΔcheRΔcheB strain expressing CheW-X2 and TarQEQE showed basal activity and response to MeAsp which were similar to the respective strain expressing the native CheW (Figure 3A and Figure 3—figure supplement 1). Nevertheless, this strain showed no apparent long-term fluctuations in the pathway activity above the shot noise, even when its activity was tuned to an intermediate level by addition of 10 µM MeAsp (Figure 3A,B). 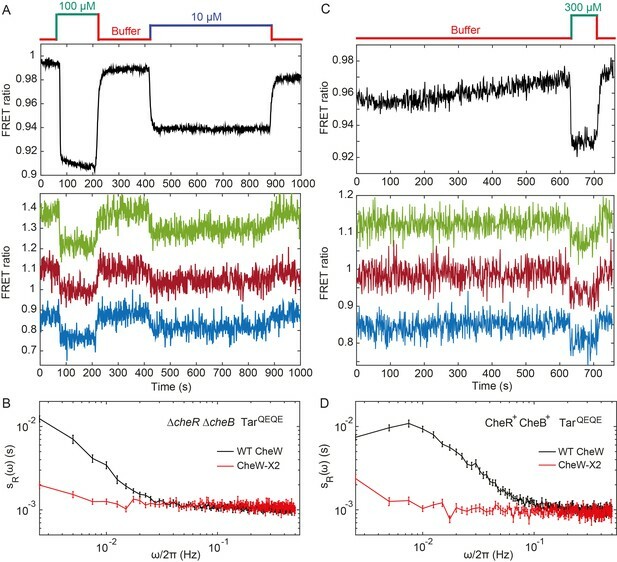 Similarly, the array disruption allowed signaling but abolished the long-term activity fluctuations in CheR+ CheB+ cells equilibrated in buffer (Figure 3C,D). Importantly, buffer-adapted CheR+ CheB+ CheW-X2 cells had intermediate receptor activity and could respond to both attractant (MeAsp) and repellent (Ni2+) stimuli, that is, both down- and upregulation of the pathway activity (Figure 3—figure supplement 2). This confirms that the observed loss of fluctuations was not caused by locking the receptor in the extreme activity state. In summary, these results demonstrate that the observed long-term fluctuations in activity, seen both with and without the receptor methylation system, require receptor clustering. Fluctuation analysis in CheW-X2 cells. (A) Population-averaged (upper panel) and typical single-cell (lower panel) measurements of the FRET ratio for ΔcheRΔcheB strain carrying CheW-X2 and TarQEQE as the sole receptor. Cells, which have a high activity in buffer, were first exposed to 100 µM MeAsp (saturating stimulus), and then to 10 µM MeAsp (sub-saturating stimulus), as indicated. The single-cell measurement traces have been shifted along the y-axis to facilitate visualization. (B) Power spectral density of the FRET ratio fluctuations in CheW-X2 ΔcheRΔcheB TarQEQE cells at intermediate activity (i.e., with 10 µM MeAsp) (red) compared to the equivalent strain carrying native (wild-type; WT) CheW and at 30 µM MeAsp (black – same data as Figure 2C). Error bars represent SEM, with sample sizes 404 (WT CheW; black) and 208 (CheW-X2; red) cells. (C) Same as (A) but for CheR+ CheB+ strain. The activity in buffer is at intermediate level (Figure 3—figure supplement 2), with 300 µM MeAsp completely inhibiting the kinase activity. (D) Power spectral density of the FRET ratio fluctuations in CheR+ CheB+ CheW-X2 strain in buffer (red) compared to the native WT CheW (black – same data as Figure 1C). Error bars represent SEM, with sample sizes 265 (WT CheW; black) and 191 (CheW-X2; red) cells. We next used mathematical analysis to better understand the respective contributions of receptor clustering and the methylation enzymes to the observed fluctuations and to determine whether methylation-independent fluctuations are generated by some out-of-equilibrium random process. We considered the fluctuation-dissipation theorem (FDT), which postulates – for systems at equilibrium – that thermal fluctuations of a quantity are related, via the temperature, to the response of this quantity to a small externally applied perturbation (Kubo, 1966). The FDT framework can be used to determine whether a system is at equilibrium, by comparing fluctuations and responses to small perturbations via their ratio, the so-called effective temperature Teffω (Robert et al., 2010; Martin et al., 2001; Mizuno et al., 2007; Cugliandolo, 2011). In equilibrium systems the FDT is satisfied and Teffω equals the physical temperature T. In out-of-equilibrium (biological) systems, the deviation of Teffω from T provides a first characterization of the underlying out-of-equilibrium noisy process generating the fluctuations, since Teffω is linked to the energy scale and frequency content of such process (Robert et al., 2010; Martin et al., 2001; Mizuno et al., 2007; Cugliandolo, 2011). Here A is the average activity around which fluctuations occur, estimated from experimental data as described above, NT is the total number of Tar dimers per cell, N is the average number of effectively coupled allosteric signaling units in the cluster, and λ is defined as before. Consistent with several recent reports (Piñas et al., 2016; Frank et al., 2016; Li and Hazelbauer, 2014) and with our analysis of the apparent response cooperativity in the CheW-X2 strain (Figure 3—figure supplement 1 and Appendix 1, 'Definition of the effective temperature'), we assumed that signaling units within the cluster correspond to trimers of receptor dimers. Finally, Re(g^(ω)) is the real part of the Fourier transform of the normalized step response function gt, which could be experimentally determined by measuring the FRET response to sufficiently small (subsaturating) stepwise attractant stimulation as g(t)=ΔR(t)/(−λXA∞ϵ0), where (-λΧA∞ϵ0) is the normalized stimulation strength (see Appendix 1, 'Phenomenological step response function'). For subsaturating stimulation of the non-adapting ΔcheRΔcheB cells (Figure 2B), the normalized step response function g-(t) exhibited a relatively rapid initial increase and then slowly approached its final value, possibly with a slight transient overshoot (Figure 4A). Nearly identical response dynamics was observed for weaker stimulations (Figure 4—figure supplement 1), validating the small perturbation assumption of the FDT for this response function measurement. This slow response dynamics is consistent with a previous report that attributed it to gradual stimulation-dependent changes in packing of receptors within clusters (Frank and Vaknin, 2013). Consistent with this interpretation, the CheW-X2 ΔcheRΔcheB strain with disrupted receptor clustering showed neither comparable latency nor overshoot in its response (Figure 3—figure supplement 3). Fluctuation-dissipation analysis of the pathway activity. (A) Step response function gt both in presence (red) and in absence (blue) of the adaptation enzymes, evaluated in cells expressing TarQEQE that respond to a step change from buffer to 0.3 µM MeAsp (CheR+ CheB+) or 30 µM MeAsp (ΔcheRΔcheB). The step response function was calculated from the measurements shown in Figure 4—figure supplement 5 and in Figure 2B as described in text and in Appendix 1, 'Phenomenological step response function'. (B,C) The PSD of the FRET ratio fluctuations sRω at A= 0.5 (blue in B and red in C), and the corresponding dissipation GR(ω) (black) calculated using Equation (2), for ΔcheRΔcheB (B) and CheR+CheB+ (C) cells. The measurement shot noise ϵn2, determined as the PSD of the receptorless cells (Figure 1B), was subtracted from sRω. Insets show the ratio between the physical and effective temperatures, calculated using Equation (1). Dashed and dotted lines in B and C indicate T/Teffω= 1 and T/Teffω= 0, respectively. (D) Contribution of thermal noise (blue) and the adaptation enzyme dynamics (red) to the PSD in CheR+ CheB+ cells, calculated from Equation (3) as explained in Appendix 1, 'Separating the contribution of methylation enzymes dynamics to the PSD in CheR+ CheB+ cells'. In all panels, error bars represent SEM, with sample sizes for the power spectra calculations being 540 (ΔcheRΔcheB) and 468 (CheR+ CheB+; aggregating data from cells expressing TarQEQE and TarEEEE as sole receptor) single cells from at least five biological replicates. As the pathway activity in the CheW-X2 ΔcheRΔcheB strain also showed no long-term fluctuations (Figure 3B,C), we hypothesized that these fluctuations might be indeed caused by the slow response dynamics stimulated by some random process. We thus calculated the corresponding dissipation using Equation (2), considering that under our conditions NT∼104 (Endres et al., 2008) and N∼14 (Endres et al., 2008; Neumann et al., 2014a; Neumann et al., 2014b; Clausznitzer et al., 2010) (see Table 1 for all parameter values). At low frequencies, the dissipation GRω was approximately equal to the shot-noise corrected sRω at A≃0.5 (Figure 4B), as predicted by Equation (1) for equilibrium systems where Teffω equals T. Consistently, the corresponding ratio T/Teff(ω) was nearly independent of ω and close to unity in the range of frequencies for which sRω is above the measurement noise (Figure 4B Inset). This suggested that in absence of adaptation enzymes the system is close to equilibrium and thermal fluctuations are the major source of noise. Although the deviation of T/Teff(ω) from unity might indicate second-order contributions of out-of-equilibrium processes, it is comparable to what was observed for other equilibrium systems with measurement methods of similar precision (Martin et al., 2001; Wang et al., 2006; Abou and Gallet, 2004). Thus, an equilibrium model can fairly accurately describe the details of observed long-time activity fluctuations in ΔcheRΔcheB cells. This agreement suggests that the receptor cluster in these cells largely acts as a passive system, where thermal fluctuations stimulate the long-term response dynamics, possibly due to slow changes in receptor packing within clusters, to generate activity fluctuations. Furthermore, the PSD of ΔcheRΔcheB cells followed the scaling A1-A, which is expected from the underlying receptor activity being a two-state variable, as evident for subpopulations of cells sorted according to their activity (Figure 4—figure supplement 2), with which our FDT analysis is consistent (Equation 2). Fluctuations were apparently unaffected by the expression level of Tar, in the tested range of induction (Figure 4—figure supplement 3). In the FDT framework, this implies that N2/NT must be constant for varying receptor expression, and previous measurements indeed suggest that the cooperativity rises with the expression level of TarQEQE in a way that N2/NT remains unchanged (Endres et al., 2008). To evaluate the respective effects of signal amplification and the slow dynamics of the cluster activity response, we performed stochastic simulations of a simple model of sensory complexes without adaptation and under thermal noise (see Appendix 1, 'Simulation of a simplified model for the array of receptors'). In this model, receptors are clustered in signaling teams that respond to allosterically amplified free energy changes on an effective time scale averaging the fast switching dynamics and the slow dynamics of the receptor cluster, which accounts qualitatively for the pathway behavior. Expectedly, larger amplification led to larger fluctuations, and the time scale of the fluctuations followed the imposed response time scale of the cluster. Less trivially, slower response also led to higher maximal amplitude of the fluctuations (Figure 4—figure supplement 4). The normalized step response function of CheR+ CheB+ cells, g+t (Figure 4A), was determined using weak stimulation by 0.3 µM MeAsp, with the activity change ΔA/A=0.25 (Figure 4—figure supplement 5 and Appendix 1, 'Phenomenological step response function'). Describing adaptation according to the classical two-state models of receptors (Barkai and Leibler, 1997; Clausznitzer et al., 2010; Mello and Tu, 2007), the responses of ΔcheRΔcheB and CheR+ CheB+ cells could be linked via the rate of adaptation ωRB, which yielded ωRB=0.06±0.01 Hz (Appendix 1, 'Link between the response functions in ΔcheRΔcheB and CheR+ CheB+ cases' and Figure 4—figure supplement 6), consistent with previous estimates (Park et al., 2010). The corresponding dissipation GR+ω, calculated as above according to Equation (2), differed strongly from the PSD of the activity fluctuations (Figure 4C), confirming that the system operates out of equilibrium. The corresponding T/Teff(ω) << 1 (Figure 4D Inset) is consistent with strong out-of-equilibrium drive. It decreased at low frequencies, crossing zero at ω/2π ≃0.015 Hz where Teff(ω) diverges (Figure 4—figure supplement 7) and dissipation becomes negative. Such crossing indicates a transition to the range of frequencies where the active process dominates (Martin et al., 2001; Sartori and Tu, 2015), with the frequency of divergence of Teffω representing interplay between the time scales of the passive receptor response and adaptation (Appendix 1, 'Frequency of effective temperature divergence'). Although relatively noisy, particularly at low frequencies, sRmω inferred from equation (3) peaked around ωpeak/2π = 0.01 Hz (Figure 4D), which equals the independently determined adaptation rate (see above), ωpeak≃ωRB=0.06 Hz. The contribution of the thermal noise sRTω had a similar magnitude but dominated at lower frequencies. The power spectrum of the CheR and CheB binding events was inferred from sRmω using the previous model and previous conclusion that the methylation-dependent activity fluctuations mainly arise from the intermittent binding of the small number of CheR and CheB molecules to the receptors (Pontius et al., 2013). This spectrum was consistent with the common assumption that CheR (CheB) loads and acts only on the inactive (active) receptor (Appendix 1, 'Separating the contribution of methylation enzymes dynamics to the PSD in CheR+ CheB+ cells' and Figure 4—figure supplement 8). We further extended our simulation model of the receptor array composed of independent signaling teams, to test whether we can reproduce the observed power spectrum in presence of adaptation enzymes. Consistent with the large excess of receptors compared to the methylation enzymes (Li and Hazelbauer, 2004), in these simulations only one CheR (or CheB) molecule can bind to the inactive (respectively active) receptor team, methylate (respectively demethylate) the receptors, and unbind once the team has turned active (respectively inactive) (Appendix 1, 'Simulation of a simplified model for the array of receptors'). The simulations agreed qualitatively well with the experiments, including the power spectra of CheR/CheB binding and effective temperature (Figure 4—figure supplement 9), although absolute amplitudes of the fluctuations were clearly underestimated by the model, as already observed in a previous theoretical work (Sartori and Tu, 2015). The simulation also reproduced the loss of slow fluctuations upon disruption of clusters in CheR+ CheB+ cells, which arises from the dependence of sRω on the size N of signaling teams. In contrast, simulating less efficient neighborhood assistance by reducing the (de)methylation rate of the bound enzymes had only modest effects (Figure 4—figure supplement 9C). Stochastic activity fluctuations are likely to have major impact on signal processing within cellular networks (ten Wolde et al., 2016; Tsimring, 2014). Nevertheless, direct visualization and characterization of such fluctuations at the posttranslational level remain limited to a small number of cases (Conlon et al., 2016; Aoki et al., 2013) primarily due to high requirements for the sensitivity and time resolution of the necessary single-cell measurements. Although fluctuations of the signaling activity can in some cases be deduced from the downstream output of the network, either gene expression (Paliwal et al., 2007; Bowsher and Swain, 2012) or behavior (Korobkova et al., 2004; Emonet and Cluzel, 2008; Park et al., 2010; Pontius et al., 2013), this output may strongly filter and reshape fluctuations. Consequently, the theoretical framework for the analysis of noise at the posttranslational level remains less developed than for variations in gene expression (Raj and van Oudenaarden, 2008; Paulsson, 2004). Here we directly monitored activity fluctuations in the chemotaxis pathway of E. coli, a common model for quantitative analysis of signal transduction (Tu, 2013; Sourjik and Wingreen, 2012; Micali and Endres, 2016). One fascinating feature of the chemotaxis pathway is the amplification of chemotactic signals through cooperative interactions within the clusters (arrays) of chemoreceptors, where at least ~10–20 receptor dimers show concerted transitions between active and inactive states (Sourjik and Berg, 2004; Li and Weis, 2000; Duke and Bray, 1999; Mello and Tu, 2003; Monod et al., 1965; Keymer et al., 2006). The pathway is also robust against external and internal perturbations, largely thanks to its methylation-based adaptation system (Barkai and Leibler, 1997; Oleksiuk et al., 2011; Yi et al., 2000; Kollmann et al., 2005; Alon et al., 1999). At the same time, the stochastic activity of the adaptation enzymes was also proposed as the reason for the observed strong variability in the signaling output, the duration of straight runs of the swimming cells (Korobkova et al., 2004; Emonet and Cluzel, 2008; Pontius et al., 2013). Indeed, inspired by so-called fluctuation-response theorems, previous analyses established a fluctuation-response relation between the adaptation time to stimuli (called response time) and the typical time scale of fluctuations of the tumbling rate in individual E. coli cells (Emonet and Cluzel, 2008; Park et al., 2010) – which we confirmed at the level of CheY phosphorylation (ωpeak≃ωRB) – demonstrating that behavioral fluctuations originate within the chemotaxis pathway and pointing to the methylation system as their likely cause. Subsequently, the fluctuations in straight run durations were proposed to enhance environmental exploration, partly since the occasional long run allows exploring wider territories (Emonet and Cluzel, 2008; He et al., 2016; Matthäus et al., 2009; Matthäus et al., 2011; Flores et al., 2012). Here we combined experimental and mathematical analyses to demonstrate that both, the adaptation system and receptor clustering contribute to the signaling noise in the chemotaxis pathway. Experimentally, we adapted the FRET-based assay that was previously applied to study average signaling properties in cell populations (Shimizu et al., 2010; Sourjik and Berg, 2004; Endres et al., 2008; Frank and Vaknin, 2013; Piñas et al., 2016; Sourjik et al., 2007; Sourjik and Berg, 2002b; Oleksiuk et al., 2011; Neumann et al., 2014a; Krembel et al., 2015a; Meir et al., 2010; Frank et al., 2016; Krembel et al., 2015b; Neumann et al., 2014b, Neumann et al., 2012Neumann et al., 2012; Clausznitzer et al., 2010), to be used at the single-cell level. Whereas previous studies have relied on the output provided by flagellar motor rotation (Korobkova et al., 2004; Park et al., 2010), using FRET enabled us to characterize the activity fluctuations directly, before their amplification by the motor. Our measurements showed that fluctuations can be comparable to the average adapted activity of the pathway and thus significantly larger than previous estimates (Tu and Grinstein, 2005). This surprisingly large amplitude of fluctuations indicates concerted variations of receptor activity across the signaling arrays containing hundreds to thousands of receptors. Furthermore, we showed that the stochasticity of receptor methylation could not be the sole cause of the pathway noise, because activity fluctuations were also observed in absence of the methylation system. In contrast, disruption of receptor clustering completely abolished these long-term activity fluctuations, even in presence of the methylation system, implying that receptor interactions are essential for the observed fluctuations. To better understand the nature of the observed fluctuations, we applied analysis based on the fluctuation-dissipation theorem (FDT), following a recent theoretical study (Sartori and Tu, 2015). The FDT establishes a fundamental relationship between thermal fluctuations and the response to externally applied perturbations for an equilibrium system. Although being a powerful tool for studying equilibrium and out-of-equilibrium systems in physics (Kubo, 1966), so far it has found only limited application in biology (Paulsson, 2004; Robert et al., 2010; Mizuno et al., 2007; Chevry et al., 2013; Bialek and Setayeshgar, 2005). For the chemotaxis system, the FDT in its equilibrium form was used to predict the magnitude of thermally activated ligand binding noise with implications for maximal sensing accuracy (Aquino et al., 2011; Bialek and Setayeshgar, 2005). The present approach is also complementary to the previous fluctuation-response analysis mentioned above (Emonet and Cluzel, 2008; Park et al., 2010), itself conceptually related to the fluctuation theorems extending the FDT for certain systems in non-equilibrium steady states (Park et al., 2010; Seifert, 2012). Comparison of fluctuations and dissipation to evaluate whether the system deviates from the FDT, together with the analysis of mutants deficient in adaptation and/or clustering, enabled to identify multiple factors contributing to the pathway noise. These factors include (i) the input thermal noise, (ii) the amplification of this noise by cooperative interactions among receptors, (iii) the delayed response function of receptor clusters, and (iv) the dynamics of the methylation system (Figure 5). Multiple sources of signaling fluctuation in the chemotaxis pathway. (A) In the absence of adaptation enzymes, thermal fluctuations stimulating – and amplified by – the dynamic receptor cluster lead to low frequency fluctuations (<0.01 Hz) around intermediate cluster activity. The blue springs symbolize the plasticity of the receptor array, the green ⨁ its cooperativity. 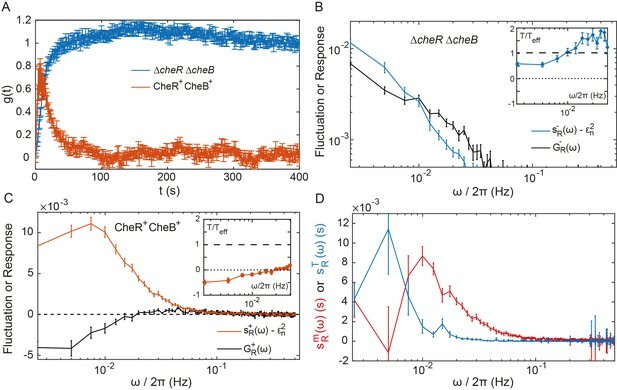 (B) In adapted wild-type cells, thermal fluctuations and fluctuations in the dynamics of CheR and CheB are amplified by the dynamic chemoreceptor cluster, which leads to fluctuations of the activity at frequencies around 0.03 Hz. (C) In the absence of clustering, responsive but non-amplifying receptor complexes do not produce observable activity fluctuations, whether or not adaptation enzymes are present. Graphs show the PSD of the FRET ratio measured in each respective case (black). In (A,C) the wild-type curve is shown for comparison (gray). Unexpectedly, the activity fluctuations in absence of the adaptation system could be explained for the most part by thermal noise acting on the receptors, which is amplified through the cooperative interactions of clustered receptors and subsequently converted into long-term pathway activity fluctuations by their slow response dynamics (Figure 5A). The contribution of out-of-equilibrium processes to these activity fluctuations seems to be minor if any. This phenomenon demonstrates that thermal noise can induce measurable fluctuations in activity of a cellular network, even in absence of active processes that are usually considered to be the main contributors to cellular dynamics. Even more striking is the amplitude of these fluctuations, suggesting that up to a half of the chemoreceptor array – that may contain thousands of receptors – flips its activity. The slow cluster dynamics was recently observed using fluorescence anisotropy measurements and attributed to the stimulation-induced changes in packing of receptors within clusters (Frank and Vaknin, 2013). Indeed, in our experiments both slow response and activity fluctuations were abolished by mutations that disrupt clustering, suggesting that it corresponds to some large-scale plasticity within the receptor array (Piñas et al., 2016). Interestingly, such stimulation-induced slow reconfiguration had been also proposed to modulate cooperativity within the receptor array in an earlier theoretical study (Hansen et al., 2010). Although the precise mechanism behind this slow dynamics was not yet characterized, meaning that it could neither be experimentally disentangled from signal amplification nor mechanistically modeled, our simulations suggest that while slow dynamics sets the time scale of activity fluctuations, both this dynamics and amplification contribute to their amplitude. It thus seems that this previously little considered feature of the receptor array plays a large role in producing and shaping the activity fluctuations. Our analysis also suggests that an effective subunit of the allosteric signaling teams corresponds to one trimer of dimers, rather than a dimer itself as assumed in previous computational models (Endres et al., 2008; Mello and Tu, 2007). This conclusion is consistent with several recent studies (Piñas et al., 2016; Frank et al., 2016; Li and Hazelbauer, 2014), and it could be easily reconciled with the previous formulations of the Monod-Wyman-Changeux models by rescaling the free-energy change per methylated glutamate by a factor of three. Since large size of the cooperative units implies fewer units per receptor array, it further helps to account for the large activity fluctuations even in absence of the methylation enzymes. Notably, on the studied range of time scales the previously proposed contribution of the high-frequency ligand binding noise (Aquino et al., 2011; Bialek and Setayeshgar, 2005) to overall fluctuations must be very small, since the observed power spectral densities depended on activity but not on the absolute ligand concentration. The dynamics of CheY/CheZ interaction is also unlikely to contribute to the observed fluctuations because the turnover rate of this complex (>1 Hz) (Li and Hazelbauer, 2004; Oleksiuk et al., 2011) is above the frequency range of our experiments. In the presence of the adaptation system the noise within receptor arrays is apparently added to the noise coming from the stochasticity of methylation events (Figure 5B), with both noise sources having comparable strength. The adaptation system not only shifts the frequency spectrum of fluctuations but also eliminates the latency of the response to stimuli, thus likely accelerating the response through its negative feedback activity. The statistics of methylation events inferred from the power spectra was compatible with previous understanding of the enzyme kinetics, including the hypothesis that methylation noise is enhanced by the ultrasensitivity to changes in the ratio of methylation enzymes (Korobkova et al., 2004; Emonet and Cluzel, 2008). Nevertheless, receptor clustering is required for the observed activity fluctuations even in presence of the adaptation system (Figure 5C), likely because of signal amplification as well as accelerated adaptation dynamics within clusters due notably to assistance neighborhoods (Li and Hazelbauer, 2005; Pontius et al., 2013; Frank et al., 2016). Our simulations suggested that the former likely plays a more prominent role in generating large activity fluctuations. Altogether, the overall picture of the signaling noise in the chemotaxis pathway is more complex than previously suggested, with the noise being first processed through a slow responding amplifier (the chemoreceptor cluster) and then fed back through the methylation system, resulting in complex colored fluctuations of the pathway activity and therefore of the swimming behavior. More generally, our study provides another example of the general relation between fluctuations and response in biological systems and it demonstrates that FDT-based analysis can distinguish between active and passive processes also within an intracellular network. Although activity fluctuations in biological systems are commonly shaped by active, out-of-equilibrium processes, meaning that in many cases the FDT will not be satisfied (Park et al., 2010), the properties of a system can nevertheless be inferred when studying the deviation of its behavior from the FDT (Robert et al., 2010; Martin et al., 2001; Mizuno et al., 2007; Chevry et al., 2013). The approach of quantifying such deviations by means of an effective temperature, or fluctuation-dissipation ratio, has been used in a variety of out-of-equilibrium systems (Cugliandolo, 2011), from glasses to biological systems. Although in some systems, for example glasses, this ratio can have indeed properties normally associated with the thermodynamic temperature, in biological systems the effective temperature rather relates to the energy scale and frequency content of the underlying out-of-equilibrium processes. This relation was previously demonstrated for several systems, including the hair bundle of the inner ear (Martin et al., 2001) and active transport in eukaryotic cells (Robert et al., 2010; Mizuno et al., 2007; Chevry et al., 2013), and we show that it also applies to a signaling pathway. Notably, the present analysis differs both in its aims and technicalities from the aforementioned fluctuation-response analysis (Emonet and Cluzel, 2008; Park et al., 2010). For instance, the FDT breakdown in CheR+CheB+ cells does not contradict the previously observed relation between fluctuation and adaptation time scales, since these two observations provide different information: that the noise source encompasses an out-of-equilibrium process and that the fluctuations originate in the chemotaxis pathway, respectively. An interesting emergent feature of our analysis is the negative effective temperature, which arises as a hallmark of the delayed adaptive negative feedback (Sartori and Tu, 2015). A similar effect was also observed in inner ear hair bundles, where it is related to the mechanical adaptation feedback (Martin et al., 2001). Negative dissipation associated to the negative temperature was predicted to indicate a reversal of causality, induced here by adaptation (Sartori and Tu, 2015): Whereas positive dissipation means that changes in receptor free energy induce activity changes, negative dissipation results from the methylation system counteracting preceding activity changes (Sartori and Tu, 2015; Sartori and Tu, 2011; Lan et al., 2012) and actively translating them into free energy changes, thus opposing the passive behavior of the receptors. Importantly, because the FDT-based analysis requires only knowledge of system’s fluctuations and its response, it is widely applicable for studying dynamics of diverse cell signaling processes, including those where molecular details are not known. E. coli strains and plasmids are listed in Supplementary file 1A,B, respectively. Cells carrying two plasmids that encode respectively Tar in the indicated modification states and the FRET pair were grown at 30°C overnight in tryptone broth (TB) supplemented with appropriate antibiotics. The culture was subsequently diluted 17:1000 in TB containing antibiotics, 2 µM salicylate (unless otherwise stated) for induction of Tar and 200 µM isopropyl β-D-1-thiogalactopyranoside (IPTG) for induction of the FRET pair, and grown at 34°C under vigorous shaking (275 rpm) to an OD600 = 0.55. Bacteria were harvested by centrifugation, washed thrice in tethering buffer (10 mM KPO4, 0.1 mM EDTA, 1 µM methionine, 10 mM lactic acid, pH 7) and stored at least 20 min at 4°C prior to the experiments. Bacterial cells were attached to poly-lysine coated slides which were subsequently fixed at the bottom of a custom-made, air-tight flow chamber, which enables a constant flow of fresh tethering buffer using a syringe pump (Pump 11 Elite, Harvard Apparatus, Holliston, Massachusetts, United States) at 0.5 ml/min. This flow was further used to stimulate cells with indicated concentrations of α-methyl-D,L-aspartate (MeAsp). The cells were observed at 40x magnification (NA = 0.95) using an automated inverted microscope (Nikon Ti Eclipse, Nikon Instruments, Tokyo, Japan) controlled by the NIS-Elements AR software (Nikon Instruments). The cells were illuminated using a 436/20 nm filtered LED light (X-cite exacte, Lumen Dynamics, Mississauga, Canada), and images were continuously recorded at a rate of 1 frame per second in two spectral channels corresponding to CFP fluorescence (472/30 nm) and YFP fluorescence (554/23 nm) using an optosplit (OptoSplit II, CAIRN Research, Faversham, United Kingdom) and the Andor Ixon 897-X3 EM-CCD camera (Andor Technology, Belfast, UK) with EM Gain 300 and exposure time of 1 s (Figure 1—figure supplement 1B). For each measurement, the field of view was chosen to contain both a small region of high density with confluent cells and a few hundred well-separated single cells (Figure 1—figure supplement 1C). During our approximately 30 min long measurements, the focus was maintained using the Nikon perfect focus system. The image analysis was performed using the NIS-Elements AR software. The CFP and YFP images, each recorded by a half of the camera chip (256 × 512 px2, 1 px = 0.40 µm), were aligned with each other by manual image registration. A gray average of the two channels was then delineated to enhance contrast and create binary masks with a user-defined, experiment-specific threshold. Individual cells were detected by segmentation of the thresholded image into individual objects, filtered according to size (3–50 µm2) and shape (excentricity < 0.86). This step resulted in a collection of distinct regions of interest (ROIs) for each frame of the movie. The ROIs were then tracked from frame to frame, using the NIS build-in tracking algorithm. Only ROIs that could be tracked over the entire duration of the experiment were further analyzed. The selected ROIs were then inspected manually and those not representing individual single cells well attached to the cover glass were discarded. Each individual measurement contained on the order of 100 tracked single cells. where Ri^(ω) is the discrete Fourier transform of the FRET ratio of cell i at frequency ω/2π, Ri^∗ its complex conjugate, . - represents a temporal average over the given time interval and ⋅i an average over all single cells considered. The error for the PSD was evaluated as 1NcTvar(Ri^(ω)Ri^∗(ω)Ri−2)i, where Nc is the number of cells. The time autocorrelation function is simply the inverse Fourier transform of the PSD. The time autocorrelation functions were fitted by Ct=C0exp⁡(-t/τ0) , for t>0 to measure the correlation time τ0, C0 being a free parameter accounting for the camera white shot noise. Although this fit was moderately accurate (0.96 ≤R2≤0.98 in all cases), it provided a simple estimate of the fluctuation time scale. Contributions of technical fluctuations (vibrations, focus drift, etc.) and of the camera shot noise to the noise on the FRET ratio was quantified using fluorescent beads (BD FACSDiva CS and T Research beads #655050) that emit both in CFP and in YFP channels. The resulting shot noise was found to be perfectly white (Figure 1—figure supplement 3A). Additional negative control experiments were performed using a receptorless strain, where no CheA-based signaling occurs. In this case, the noise in FRET ratio was also mostly white, except at very low frequency (Figure 1—figure supplement 3B). Where indicated, the power spectra of other strains were corrected by subtracting the power spectrum of the receptorless strain, to obtain the ‘pure’ activity fluctuation spectra. The value of λ, 0.10±0.01, converting FRET ratio changes to kinase activity changes, was estimated using data for the ΔcheRΔcheB TarQEQE strain as λ=R- 0-R-100 μM, the difference, averaged over all cells, between the FRET ratio in buffer, where the activity should be maximal (i.e., equal to one), and the ratio upon saturating stimulation with 100 µM MeAsp. A similar value λ=0.09±0.01 could be estimated in the adaptation-proficient strains, as the difference between the minimal FRET ratio value reached just after stimulation with 100 µM MeAsp and the maximal value reached upon removal of this stimulus. However, this latter value was slightly less precise because it is not certain that full receptor activity is reached upon stimulation removal, and the more reliable ΔcheRΔcheB value was used in all cases. For TarQEQE receptors in non-adapting strains, we assumed that all the receptors are fully active in buffer conditions and fully inactive upon stimulation with 100 µM MeAsp. The pathway activity in each cell was thus evaluated as A = 1-R-preStim-30μM- R-30 μMR- preStim-100 μM -R-100 μM. The use of the two different prestimulus values in buffer enables to minimize the effect of FRET baseline variation due to bleaching of fluorophores during image acquisition. Cells were then sorted according to their activity and divided into n equally populated subpopulations, and for each subpopulation the average PSD sRωA at average activity A of the subpopulation was evaluated for the set of frequencies displayed in Figure 4—figure supplement 2. This procedure was implemented for several values of n, namely n=10, 9, 6, 5 and 4, and the whole resulting data was used to plot sRωA as a function of A (Figure 4—figure supplement 2A). This Appendix presents four partially independent theoretical derivations of equations and concepts presented in the main text. ∂Δat∂Δh0 is the response of a at time t > 0 to the small impulse perturbation Δh applied transiently at time 0. It is called impulse response function, usually denoted χat. This relation can also be expressed in Fourier space (decomposing all temporal signals in terms of periodic functions) as: sa(ω)=−2 kTωIm χ^a(ω), where saω is the power spectrum of a and χ^a(ω) is the Fourier transform ofχa(t), typically referred to as ‘dynamic susceptibility’. This FDT ratio is a way to quantify some ‘’distance to equilibrium’’, introducing the effective temperature Teff(ω). The system is in equilibrium only if the ratio equals one at all frequencies. We model the receptors by two-state objects, being either kinase activating (ON) or kinase inhibiting (OFF). The free energy difference between ON and OFF is ∆f0=γm+ηc for a single receptor, with ηc=ln⁡1+cKOFF/1+cKON being the contribution of attractant binding and γm=k0-k1m being the contribution of the receptor methylation. where J are the coupling strengths, S, V and W describe the network by determining whether two components are coupled and Ai is the Boolean activity of the kinase i.
where N is a fitted parameter, corresponding to an effective "team size", which is proportional to the average number of neighboring receptors with the same activity (see 'Definition of the effective temperature'). The MWC does not allow individual receptors to fluctuate within their team nor any team rearrangement. This is unsatisfactory since individual receptors are expected to undergo independent thermal and/or active perturbations and the slow dynamics in the ΔcheRΔcheB strain might come from some remodeling of teams of receptors with the same activity (Hansen et al., 2010). The Ising model, which possesses those two properties, was therefore preferred. with kR and kB being the rates of methylation and de-methylation, respectively (Clausznitzer et al., 2010). Here and in the following, we use a superscript ‘-’ to refer to quantities in the ΔcheRΔcheB case, and superscript ‘+’ for the CheR+CheB+ case. In the all models so far, the activity switches very rapidly to its steady state value δa+∞, meaning that χa-τ is well approximated by a delta function. However, as observed in Figure 4A of the main text, step stimulation with MeAsp, which corresponds to the application of a constant ϵ0 to the receptors, induces also a long term dynamics of the activity, not captured by the models. A phenomenological description of this long term dynamics was therefore used, leading to a more complex form of χa-τ. which goes from 0 at t=0 to 1 at t=+∞. Here ΔR+(t) is the measured YFP/CFP ratio during a small stimulation of free energy ϵ0 in CheR+ CheB+ cells expressing Tar only and λ is the experimentally determined proportionality factor between FRET ratio and activity. Since the response is adaptive, the stimulation -λΧA∞ϵ0 cannot be deduced from the final change in FRET ratio (ΔR(+∞)). It was rather computed using ⟨A⟩=0.5 and ϵ0=ln⁡(1+Δc/Koff), with Koff = 7 µM, which is lower than the value typically used for WT cells (Koff=18 µM) (Kalinin et al., 2009), to account for the increased sensitivity of the Tar-only strain at our expression level (Krembel et al., 2015b). The characteristic frequency is ωY=2Hz (Vladimirov et al., 2008), which lies in the range of frequencies for which our measurements are dominated by instrumental noise. Therefore CheY/CheZ dynamics was neglected. Equation A19 reduces to one in the range of frequencies for which our measurement is above noise, and iωϵsω=1-iωτs1+iωτs . (A.19) was assumed for most of the analysis. Only for measuring the time scale of adaptation ωRB and the relation between g+ and ('Effect of diffusive smoothing of the step function') of this supplement) was the full Equation A18 needed. Since receptors are coupled, sAcellω= 1TNT2∑k=1NT∑k'=1NTδakωδak'*(ω), (A.22) is not necessarily zero. In the Ising model, we have δak(ω) δak'(ω), where δakωδak'*(ω)= δakω2 C(rkk') is the correlation function between receptors distant from C(rkk') on the lattice, which decreases exponentially on a given length scale (Berg, 2003), so that rkk', where ∑k=1NT∑k'=1NTδakωδak'*(ω)=NTNr δakω2 is the average number of correlated receptors in the cluster (the loose equivalent of the team size of the MWC model), which is expected to be proportional to the cooperativity number N (Equation A5). corresponding to Equation 1 and 2 of the main text, which defines the dissipation GR(ω)=−2 λ23N2A(1−A)NTRe(g^(ω)). Note that although we expressed the fluctuation dissipation relation in terms of activity, which allows us to directly compare the analysis with experimental data, this relation can be formulated for any variable (e.g., receptor conformation) that itself determines the activity. Note that the ΔcheRΔcheB case is obtained again if ωRB=0. (A30) g^meas+(ω)=iωϵs(ω) g^meas−(ω)iωϵs(ω)+ωRB g^meas− (ω). Using g^meas+ω=iωϵsω g^meas-ωiωϵsω+ωRB g^meas- ω. A.30, with ϵst=1-exp⁡-tτs s, the equivalent of Equation A30 in real space was fitted using the experimentally determined g^meas−(ω) and g^meas+ω, with g^meas+(ω) as a free parameter, yielding ωRB Hz (Figure 4—figure supplement 5). In the CheR+ CheB+ case, the effective temperature diverges when Reg^+(ω)=0. Equation A29 thus yield an implicit equation for the frequency at which this divergence occurs, −Reg^−(ωdvg) =ωRB |g^−(ωdvg)|2, which has a solution since Reg^−(ω) is negative. This equation clearly represents a balance between the action of the cluster cooperative response (represented by Reg-ω) and adaptation (represented by g-). The solution is however not trivial, in particular ωRB, and will depend on both the time scales of cluster dynamics and adaptation. Notably, in (Sartori and Tu, 2015) the typical time scale of the cluster dynamics was chosen to be much shorter than the one suggested by our measurements, resulting in higher frequency of effective temperature divergence. Here δakω= ΧA∞ iωg^-ω -ϵkω+ k1δmkω A.31 represents thermal noise acting on the receptor, and iω δmk= - kR+ kBδakω+δrkω+δbkω A.32 and δbk(ω) represent noise coming from the intermittent action of CheR and CheB, respectively (see below for possible interpretation of these fluctuations). Here the thermal noise contribution in presence of adaptation is sRT(ω)=|g+(ω)g−(ω)|2sR−(ω). These equations enable to identify δrk=wr1-Ark-NRNT A.40 (δbk=wbAbk-NBNT A.41) as the fluctuations in occupancy of a given receptor by CheR (CheB) and thus δrk as the power spectrum of enzyme binding dynamics. Although noisy, δbk appeared to decrease at low frequency (Figure 4—figure supplement 8). Such a decrease indicates anti-correlations (Peng et al., 1993) in the binding dynamics of the methylation enzymes at their substrates, which is consistent with the common assumption that CheR (CheB) loads and acts only on the inactive (active) receptor. For the example of CheR, this activity dependence implies that once receptor is active, it will not allow CheR to reload and restart acting until it switches back into the inactive state, thus introducing a delay in the rebinding of the enzyme. As a consequence, enzyme binding anti-correlates on the time scale of this delay. Here, ak is the attractant dependant stimulation, wa is the flipping rate of the kinase and mk is the total methylation level of the team. Parameters used in the simulations. If Δf0 is fixed, Equation A42 is a simple model for the ΔcheRΔcheB case. Since the activity of a single team can only take 0 or 1 as a value, it fluctuates between these two values, being only on average equal to mk. Since the teams are uncoordinated, the average activity of the whole cluster will fluctuate as well. This dynamics represents the thermal fluctuations in a MWC model. This dynamics was simulated for T = 1000 s after an equilibration period from a random initial condition of same duration, for mk repeats, with 1/(1+eF), that is n = 100. Increasing latencies in the response to stimulations of the receptor cluster were modeled by decreasing F=0, for a fixed amplification factor ⟨a⟩=0.5. As expected, the thermal fluctuations were slower for lower N = 14. The maximal amplitude of the fluctuations was also larger when wa was larger (Figure 4—figure supplement 4). Increasing N while keeping the total number of receptors constant (i.e. decreasing wa accordingly), at fixed wa, led to an increased amplitude of the fluctuations, their temporal dependences being however not affected (Figure 4—figure supplement 4). The power spectra however differed from experimental data. The amplitude was underestimated because the MWC does not allow applying thermal fluctuations to individual receptor. The time dependence was also different because we modeled the slow receptor cluster dynamics by lengthening the switching rate Nteam, which is the only time scale of the model, where in reality they probably are different processes. under the constraint drkdt=wl1-rk1-bk1-ak-wurkak A.44 and dbkdt=wl1-rk1-bkak-wubk1-ak A.45. This means that CheR (CheB) may only load, if free enzymes are available, on free inactive (active) receptors with rate ∑kbk≤btot and unload once the receptor turned active (inactive) with rate wu. The typical dynamics in the simulation will then be the following. Take, for example, a weakly methylated team. Its activity will get to zero (Equation A42). If free CheR is available, it will load on the team (Equation A44) and methylate it (Equation A43), until the methylation level is high enough to activate the team (Equation A42). CheR will then unload (Equation A44), and a hypothetic free CheB can then load on the team (Equation A45) to demethylate it and bring it to its initial state. Output quantities were averaged over n = 100 independent simulations of single cells. In practice, ∑krk≤rtot, wl, and wu were chosen of the same order of magnitude, and they were the slowest dynamics, whereas wl was the fastest, in order to obtain reasonable dynamics. Starting from a random initial condition, the system was let to equilibrate at wa for 100 times the slowest time scale of the system (wm). The system was then challenged with free energy perturbation Δf0= 0 (mimicking the experimental conditions) to measure the step response function, computed as 1/wl. Figure 4—figure supplement 9A shows the normalized step response function compared to its experimental counterpart with excellent agreement (although absolute amplitudes differed moderately). A T = 800 s equilibrated run was further used to compute power spectra, using Equation A5 of the main text. The power spectra of Δf0=ln⁡(1+0.3/7) and gsimut=ΔytNeffΔf0, corresponding to the inferred rk defined in Equation A36, show good qualitative agreement with the experimental data, with a transition from high values at frequencies larger than 0.01 Hz to low values below this threshold (Figure 4—figure supplement 9B). This transition indicates anti-correlations in the occupancy of the receptor teams by the enzymes, which emerge from their activity-dependant loading and unloading. The two spectra are equal within noise by construction of the model (r and b play symmetric roles). Furthermore, the simulated power spectrum of the activity bk was similar to the experimental power spectrum corrected for long term cluster dynamics (compare Figure 4D with Figure 4—figure supplement 9C). The amplitude of the power spectrum was however ~ 100 fold lower than in experiments, but in line with previous simulations (Sartori and Tu, 2015). It compares qualitatively well with the experimental effective temperature, with concordant frequencies of divergence (Figure 4—figure supplement 9D). Differences appear for the lowest frequencies, probably because of the long-term dynamics of the receptor clusters, which was not accounted for by these simulations. All things being otherwise equal, modifying N to 2 and Nteam to 2100, which models the disruption of the chemoreceptor clusters into individual trimers of dimers, reduced strongly the fluctuations in activity (Figure 4—figure supplement 9C). Decreasing the specific rate of receptor (de)methylation when the enzyme is bound to the receptors, wm , to wm = 0.016 s-1 had however little effect (Figure 4—figure supplement 9C). Note that in both cases the adaptation time is reduced by a similar factor (7 and 6, respectively), since this time is proportional to the product Nωm , as evident from (Equation A41) and (A42). Conditional tethering of the adaptation enzymes to the receptors therefore seems to account relatively well for the observed dynamics. One important discrepancy between simulations and experiments is in the amplitudes of the fluctuations, which are much larger than expected in experiments, when the simple MWC model is considered. Reviews of Modern Physics 83:81–129. Current Opinion in Microbiology 39:24–33. Journal of Physics A: Mathematical and Theoretical 44:483001. The Journal of Biological Chemistry 266:1491. Reports on Progress in Physics 29:255–284. Journal of Molecular Biology 12:88–118. The Journal of Biological Chemistry 266:9746. Journal of Statistical Physics 142:1206. Reports on Progress in Physics 75:126001. Journal of Molecular Biology 329:291–309. Journal of Statistical Physics 162:1395–1424. Annual Review of Biophysics 42:337–359. Thank you for submitting your article "Multiple sources of signaling noise in bacterial chemotaxis network" for consideration by eLife. Your article has been reviewed by three peer reviewers, and the evaluation has been overseen by Naama Barkai as the Senior and Reviewing Editor. The reviewers have opted to remain anonymous. FRET technique is applied to study the contributions to demonstrate that variability in the methylation or cooperativity of the chemotactic receptor to contribute to signaling noise in the bacterial chemotaxis system. This extends previous studies which focused on gene-regulatory noise. To this end, the authors analyze mutants that are defective in methylation or in clustering. A theoretical framework, based on fluctuation-dissipation theorem (FDT), is used to interpret the data. As you can see from the individual reviews, all three reviewers found the subject interesting and that the work has the potential to be of broad interest. However, some significant revisions are still required. 1) Presentation should be improved in terms of motivation, schematics, and readability. 2) Additional controls are required more make sure that noise in single-cell FRET is really due to processes inside cells, e.g. by imaging background without cells (receptor-less strain not enough). 3) More rigor is needed in the theory development (best in an appendix), putting in context of previous FDT work in bacterial chemotaxis, and stressing novelty. 4) The main novelty is noise due to cooperative receptors, which is discussed only very briefly in paper. This claim would potentially require more elaboration (e.g. to separate receptor rearrangement from signaling noise). For the latter, receptor could be overexpressed or crosslinked to increase clustering. Theory is vague at best including Ising vs. MWC, 'adjustment' and 'rescaling' of data, and non-constant effective Temperature, and limits of applicability of FDT also need to be clarified. The aim of this paper is to experimentally demonstrate multiple sources of signaling noise in the bacterial chemotaxis pathway, as most previous works dealt with gene-regulatory noise. Using the in vivo FRET technique in the bacterium E. coli, the authors show that there are significant contributions to the noise from receptor methylation (shown previously by the Cluzel lab) as well as receptor cooperativity. For the former, the authors use receptor mutants in fixed methylation-like states without the adaptation enzymes CheR and CheB. For the latter they utilize the CheW-Χ2 mutant, where the adapter protein CheW does not lead to receptor clustering (but nevertheless signals to the downstream kinase). As a control, they also exploit cells without receptors to estimate the noise floor in absence of receptor signaling and adaptation. The results are cast in the form of the fluctuation-dissipation theorem (FDT), which, for near-equilibrium systems, says that the power spectrum of the equilibrium fluctuations equals the response to a (small) nonequilibrium perturbation. In practice, the FDT is often used to predict nonequilibrium behavior using only knowledge from equilibrium fluctuations. How this might apply to nonequilibrium systems is still subject of ongoing research. However, here the authors use the concept of an effective temperature to frame the nonequilibrium problem as an equilibrium-like problem. The negative sign of the effective temperature is interpreted as evidence for a strongly driven, nonequilibrium system. The topic of the paper is of general interest to people working in quantitative biology. However, there are a number of concerns regarding presentation of the results and derivation of the theory, which would need to be addressed thoroughly. Subsection “Role of receptor cooperativity in signaling noise”: The noise from receptor methylation has been investigated before [Emonet and Cluzel, 2008; Park et al., 2010], so that the main experimental novelty is the signaling noise from receptor cooperativity. What is the nature of this noise – fluctuations in the signaling state or rearrangement of receptor clusters? Is there any way to separate these? This novelty section is only 10 lines long. Subsection “Fluctuation dissipation relation for receptor clusters” on FDT: There has been significant amount of work on FDT-like properties including [Emonet and Cluzel, 2008] and [Park et al., 2010]. In the latter, they talk about the fluctuation-response theorem. What is the difference, and how does the current work fit into the context of the previous works? Figure 4 legend: The caption says that "adaptation deficient" cells were used to obtain response function in Figure 4A. But the response function shown in this panel overshoots and adapts. How can these be the adaptation-deficient cells? Figure 4B, C: These panels show power spectra and response functions for both the non-adapting (B) and adapting (C) strains, but panel A only shows response function for one strain. Where is the other response function? Panel C shows three curves but legend only mentions two-line styles. What does "rescaled" in B and "adjustment" in C really mean (in plain English)? To obtain response function, a 30 μM stimulus was apparently used, but is result really independent of stimulus strength (as long as small), or does each case need to be adjusted or rescaled separately? The theory in Materials and methods seems to be developed used an oscillating stimulus. Does it matter what the stimulus looks like? Figure 4D: For the FDT to make any sense, Teff should be constant (independent of omega), which seems to be the case when plotted as in panel D. But upon closer inspection, the blue curve changes from 2 to almost zero, so this isn't constant after all. Introduction, fifth paragraph and subsection “Modeling activity fluctuations in the framework of fluctuation dissipation relation”, first two paragraphs (Materials and methods): both the Ising and the MWC model are used. Why both? Why not just use the simpler MWC model? Subsection “Fluctuation dissipation relation for receptor clusters” on FDT: A major issue is that the theory is only described very briefly in the Materials and methods section, and that it is almost impossible to understand. Why is it not derived in detail, e.g. in the Appendix (which is currently only one page long). When looking through the literature, found paper Clausnitzer and Enders, BMC SB (2011), which also seems to derive response functions and signaling noises. How does the current work relate to their theory and predictions? Another theory paper, [Sartori and Tu, 2015], says that the FDT breaks down or is violated in the chemotaxis pathway. Why is the FDT then used to study the chemotaxis pathway? Why do power spectra and response functions even match? Maybe the rescaling/adjustment really means that they don't match. This paper aims at quantifying beside the methylation/adaptive system whether receptors can contribute to the signaling noise of the chemotaxis network in E. coli. The authors use a robust technique based on the tandem FRET CheY-YFP and CheZ-CFP that has been well-established about more than 10 years ago. The technical improvement from older studies by the same group is that they now use a CCD camera to monitor fluctuations in the Fret signal at the single cell level. This single-cell approach allows them to monitor with great precision the temporal fluctuations in the levels of the signaling molecule, CheYp. To some extent, this paper follows mainly the same plan as Korobkova et al. Nature 2004 and Park et al. Nature 2010. Although this paper could sound like an incremental contribution, in fact it is not. The main reason being that these initial Nature papers quantified the signaling noise in a very indirect way and have ignored the central role of the receptors; Colin et al. identified the cooperativity between receptors as a key source of the signaling noise. While I feel this paper should be published in eLife, I have, however, few concerns that need to be addressed to make sure that the approach is watertight and the conclusions are accurate. 1) The noise of receptorless strain still shows non-negligible noise at long time scale (Figure 1). Is the fact that the power spectrum is not flat at long timescale comes from photobleaching of the FRET pair? What is the photobleaching of the signal over the duration of the experiment? In other words what is the t1/2? In any case it seems that it would be possible to normalize the power spectra of R(t) with the power spectrum from the receptorless cells in order to get rid of the unwanted noise due to photobleaching at long time scale. However, this procedure would change the current shape of the spectra at long time scale. How does photobleaching shape the power spectra of R(t) at long time scale? 2) Varying CheR level should change the relative importance of noise from the receptors versus methylation/adaptation. What is the expression level of Tar relative to [CheR] in this experiment? I am asking this because the adaptive pathway (methylation) becomes noisy only when CheR works at saturation in the ultrasensitive regime, as demonstrated in Korobkova et al. For example, if [CheR] is slightly larger than wildtype level the noise vanishes. It is therefore not enough to adjust the activity at half level to guarantee that CheR is within the saturation regime since several ratios of MeAsp/Tar/CheR can yield the same level activity. It is key in Figure 3 to know what are levels of Tar with respect to CheR levels if CheR works at saturation in order to draw a robust conclusion. Without this information, I don't find the main conclusion of the paper sufficiently supported: "These results demonstrate that long-term fluctuations in activity observed either with or without the receptor methylation system require cooperative interactions between receptors". 3) Overall I find the part of the paper on the FDT weaker because it does not bring pieces of information that we did not know before. Maybe part of it – if not all – should be move to the Appendix? 4) CheZ/CheYp cycle is not taken into account in the fluctuation-dissipation formula. The authors should either justify why or include it. 5) In order to apply the FDT, the authors should apply a stimulus small enough so that the response of the system is linear. But how do the authors make sure that they are in the linear regime? For example in Park et al. a small stepwise stimulus of 10nM of L-Aspartate (which corresponds to 1 microM of MeAsp), is close to the limit of the sensitivity of the system. Here the authors use a stimulus (>10 microM of MeAsp) that is an order of magnitude larger than that is expected to yield a linear regime. Similarly, in Martin et al. PNAS 2001 (ref 64), a great care is taken to be in the linear regime as well "We chose displacement amplitudes small enough to maintain the bundle in a regime of linear responsiveness". Again how did the authors demonstrate that 10 (or 30) microM of MeAsp stimulus would yield a linear response? The manuscript by Colin and coworkers use FRET to evaluate the dynamics of the chemotaxis system in single cells. There are several things to like about this manuscript. The authors consider one of the most interesting and well worked-out model systems in biology, and use more technically advanced imaging methods to make new discoveries. That in itself could make it of potentially broad interest. However, though I am quite familiar with stochastic analyses of bacteria, I did not find this manuscript easy to evaluate. In terms of novelty and importance I would defer to reviewers with more expertise in the specific topic. At this stage my concerns are mostly about clarification and presentation, and I do not feel comfortable recommending that the paper be accepted or rejected before these issues are explained. First, the paper is just not written for a general audience. It jumps into the details of chemotaxis without much explanation or motivation. To make it appropriate for eLife would require much more explanations of the basic system, including cartoons, more descriptions of the mutants involved, stronger motivations of the questions, and a more clear emphasis of the importance of the findings. What were the surprises or big wins that scientists not working directly with chemotaxis should care about? Second, I suspect the methods are solid, but that is hard to judge as a reader. The authors emphasize that there is a technical advancement because they no longer need to average out the FRET data over several cells, and show how the average of their single cells reproduces previous population results. That on its own in no way means that the assay is reliable in terms of the noise in single cells. I would like to see at least one paragraph describing the controls made to ensure that the noise is due to the biology, and not to imaging (heterogeneity in the evenness of excitation, camera noise etc. ), to cell handling (that conditions are uniform in space and time etc.) or to reporter artefacts (that the FRET pair does not affect the circuit's behavior). Only once these controls are completed would it make sense to consider the biology. Third, the FDT analysis is not clearly presented for a broad audience. The expected limitations of FDT analyses (thermodynamic equilibrium, or other special considerations that may or may not be satisfied in any particular system) are not really discussed, and the results will not be easy to understand for a broader audience (maybe not even for a specialized audience), e.g. the discussion of effective temperature. In my opinion the authors need to set up the question more clearly, explain the results in the language of biology or chemical kinetics rather than thermodynamics, and ensure that there is a clear narrative arc. The analysis currently comes across as a technical report for people already familiar with both the system and the analysis. I also found it odd that a recent paper from the Cluzel group was not discussed, since I believe that was the first paper showing that the fluctuation-dissipation approximation holds for some aspects of the chemotaxis system, despite an absence of thermodynamic equilibrium. Thank you for resubmitting your work entitled "Multiple sources of slow activity fluctuations in bacterial chemosensory network" for further consideration at eLife. Your revised article has been favorably evaluated by Naama Barkai as the Senior and Reviewing Editor, and two reviewers. Please correct the FDT analysis, or move it to the Appendix, as suggested by the reviewer. In addition, please rewrite the Abstract accordingly. In this resubmission, Colin et al. have significantly improved the readability of the paper and the theory development in the new appendix, and they added further valuable experimental controls. Although entangled in the data, I particularly like that the origins of the slow activity fluctuations could be separated into receptor dynamics and amplification by extra simulations. Overall, this is a significant contribution to chemotaxis signal transduction and quantitative cell biology as signaling noise has not been treated much so far, and I recommend publication. The main experimental results of this work are interesting and novel, and they should be published in eLife. The authors have clarified some of the issues of presentations that I initially had. However, the section and discussion about the application of the FDT weakens the paper because it does not bring new information about the chemotaxis system itself, and most importantly because the data do not clearly support the FDT analysis. My recommendation is to either move the section about the FDT to the Appendix and then tune down the associated claim, or maybe better to remove it entirely. The rest of the analysis with the simulations associated with Figure 5 has the merit to illustrate the different sources of noise and helps with the clarity of the paper. 1) With inset of Figure 4B, the authors claim that the ratio T/Teff is ~ 1, which would imply that the system is at the thermal equilibrium. I quote: "The deviation of T/Teff from unity was within the range of estimations with measurement methods of similar precision": I think what this convoluted phrase means is that the deviation from 1 of the ratio T/Teff is not statistically significant. But then the error bars displayed in the inset do not include the unity, which should imply that the ratio is statistically different from unity. In fact, T/Teff is clearly not constant: it is about 0.5 for frequencies<10^-2 and above 1 (>1.5) at higher frequencies. Next, in inset Figure 4C the authors used a much larger scale to plot T/Teff and now claim that the deviation (<=-0.5) from 0 is statistically significant and is the signature of a negative feedback loop. To conclude, the authors do not apply the same statistical standard to these two different insets, which makes the FDT analysis questionable. By contrast, in the cited Martin, Hudspeth and Julicher, 2001 (Figure 3C in Martin et al., PNAS 2001) the ratio T/Teff was randomly distributed above and below the straight line T/Teff=1 over an order of magnitude in frequency, and the error bars were all crossing the straight line T/Teff=1. In Martin et al., there is no doubt about the analysis and the interpretation of the data unlike this current work. 2) The FDT analysis may be more convincing if the authors could fit with a quantitative model the ratio T/Teff like it was done for example in the Martin et al. It should be doable because the authors seem to have a full model that includes the clustering of the receptors with the adaptation pathway. 3) More generally, even if the FDT analysis were more solid, as it currently stands it does not yield new and interesting insights about the biology of the chemotaxis system. We already know that the methylation/CheA system is an energetically active process and that the cooperativity of the receptors is not. Consequently, this analysis (if proven correct) is more like a control analysis and should not hinder the main experimental results of this paper. 4) Along the same lines, the Abstract should be rewritten because it does not provide the necessary background to understand what is actually novel in this paper. As it currently stands, the abstract is a little deceptive because it suggests that the authors' study is the first one to use the FDT to analyze the chemotaxis and signaling pathways in general. For example, the concluding phrase is particularly puzzling: "We propose that such fluctuation analysis could be generally applicable to cellular networks" Of course this approach is far from being new (see Bialek et al. ; PNAS; Emonet et al. PNAS; Park et al. etc…). The manuscript has been largely revised to clarify motivation, data presentation, theory development and discussion of the results and their significance in the context of published work. We notably extended and reorganized Introduction and Discussion to improve readability. We further emphasized the significance of our study in the broader context of understanding signaling noise in biochemical networks and navigation strategies of bacteria. We introduced additional explanatory figures, Figure 1—figure supplement 1 illustrating the chemotaxis pathway and the experimental setup, and Figure 5 with the graphic summary of the main results of the paper. We also modified the Results section, transferring partly redundant experimental information to supplementary figures and most of the theory development to the new Appendix, as suggested below and recommended by eLife guidelines. We performed additional experiments, including the suggested negative control as well as measurements of response functions in both cheRB- and CheRB+ cells using small stimuli. Additional setup control using fluorescent beads is presented and discussed in Results and Materials and methods, as well as in new Figure 1—figure supplement 3. The verification of small stimulus assumption, as well as the new measurement of the response to small stimuli in CheRB+ cells, are now presented in Figure 4, as well as Figure 4—figure supplements 1 and 5. This last measurement enabled to substantially improve the FDT analysis (see #3). These points are further discussed in our fourth response to reviewer 1, reviewer 2 comment 1 and reviewer 3 comment 2. 3) More rigor is needed in the theory development (best in Appendix), putting in context of previous FDT work in bacterial chemotaxis, and stressing novelty. We improved presentation of the theory, largely extending the Appendix, and discussed more extensively the results of our analysis and their novelty and significance in the context of previously published work. To this end, Results and Discussion were significantly modified. Theory development was moved to Appendix, and reformulated to better explain our approach of comparing fluctuations and dissipation terms of the FDT to evaluate whether the system is at equilibrium or, if not, how far it deviates from equilibrium. Although the results remained unchanged for the cheRB- case, in CheRB+ cells, these measurements enabled to refine the FDT analysis. We also now systematically used complementary modeling approaches, coupled to a simulated toy model, to reevaluate the contribution of the methylation system and different aspects of receptor clustering to the activity fluctuations (see reviewer 1 responses 1, 4 5, 7). We explain where our work, although mostly compatible with previous results obtained using conceptually similar approaches (e.g. refs. Emonet et al. 2008, Park et al., 2010), advances the analysis of fluctuations in the chemotaxis pathway (see reviewer 1 responses 2 and 7). More generally, we reformulated discussion on how deviation from FDT can help to learn about the mechanisms behind fluctuations in relation to previous work (e.g. ref. Martin et al. 2001). We expanded the discussion of the role of receptor clustering / cooperativity in the observed activity fluctuations. Experimentally decoupling these different aspects of receptor clustering (signal amplification vs. slow receptor rearrangements) is currently not feasible, mainly because we do not fully understand the mechanism behind slow receptor rearrangements. Varying levels of receptor expression had little effect, see Figure 4—figure supplement 3, presumably because it does not sufficiently change clustering in the expression range where the response still could be measured, whereas chemical in-vivo crosslinking will most likely abolish receptor activity and have major impact on cell physiology. But, significantly modifying Results and Discussion, we have now used theoretical analysis to better understand the importance of different aspects of receptor clustering as well as the relative importance of receptor cooperativity and methylation. We have also streamlined the theory, clarified terminology and improved discussion of the FDT application, including the definition and the meaning of effective temperature. We further emphasize more clearly that deviation of the system’s behavior from the FDT is itself informative, as it enables us to determine the range of frequencies in which the active system operates. 1) Subsection “Role of receptor cooperativity in signaling noise”: The noise from receptor methylation has been investigated before [Emonet and Cluzel, 2008; Park et al., 2010], so that the main experimental novelty is the signaling noise from receptor cooperativity. What is the nature of this noise – fluctuations in the signaling state or rearrangement of receptor clusters? Is there any way to separate these? This novelty section is only 10 lines long. We have now improved the discussion of different aspects of receptor clustering that may contribute to the observed signaling noise, both in the Results and in the Discussion sections. While decoupling different contributions of clustering to signaling noise is not feasible experimentally (see #4 above), we now expanded our mathematical analysis to clarify these contributions. For clustering-dependent fluctuations in cheRB-minus cells mentioned by the reviewer, we believe that the noise arises from thermally activated slow activity dynamics of the receptor cluster, possibly coming from rearrangements within the cluster. We also believe that the signaling state and receptor arrangement are inherently connected, so that fluctuations in signaling state result from fluctuations in receptor arrangement, but at the same time activity changes drive rearrangement. The exact mechanism of this slow activity dynamics, which was observed relatively recently, is not yet fully understood. We now more clearly summarize our understanding of the nature of fluctuations in cheRB-minus as well as in CheRB+ cells in Discussion. We now more explicitly place our work in the context of these previous studies in the Discussion. The fluctuation-response terminology has several different applications in the literature, which we agree do not contribute to clarity: (1) in systems at equilibrium, a fluctuation-response relation is basically the zero-frequency limit of a fluctuation dissipation relation; (2) in certain classes of out-of-equilibrium systems in steady state, an extension of the FDT can be formulated, which is then called a fluctuation-response theorem; (3) following a reasoning conceptually related to the fluctuation-response theorem, refs [Emonet and Cluzel, 2008] and [Park et al., 2010] established a relation between the time scales of adaptation (called response time in these publications) and that of the fluctuations, which was termed fluctuation-response relation. As now pointed out in the Discussion, we also observe this relation, but although our FDT analysis is conceptually related to approaches (2) and (3), it is different both in its aims and technicalities, since it exploits the FDT and the system’s deviations from it to identify the noise sources in the system. The fact that FDT breaks down in CheRB+ case is compatible with the relation between fluctuation and adaptation time scales, since they give different, though related, information: the noise source encompasses an out-of-equilibrium process and the fluctuations originate in the chemotaxis pathway, respectively. These cheRB- cells are indeed deficient in the methylation-based adaptation system and do not show adaptation comparable to the one observed in CheRB+ cells, so the statement “adaptation deficient” is in principle correct. However, the reviewer is right to point out that the response function in these cheRB- cells shows an interesting behavior, weakly overshooting and then “adapting”. Although weak, this behavior is reproducible (it can also be seen in Figure 2), and we believe that it results from activity-dependent slow rearrangements within the chemoreceptor clusters. We now mention this point explicitly in the text. To avoid confusion, we also now refer to these cells in the text and figure legends as “ΔcheRΔcheB” or “lacking adaptation enzymes” rather than “adaptation deficient”. We apologize for unclear definitions and thank the reviewer for suggesting the improvements. We have now confirmed that the response function of the cheRB- strain is essentially the same for a weaker stimulus, confirming that it is indeed independent of the stimulus strength for sub-saturating stimuli (new Figure 4—figure supplement 1). We have now also directly measured the response function of the CheRB+ strain using a weak stimulus, rather than inferring it from the response function of the cheRB- strain with the help of the adaptation model as done in the previous version of the manuscript (new Figure 4A). This improved the quality of our FDT analysis for CheRB+ cells, notably by independently determining the time scale of adaptation and the fluctuation dissipation ratio in presence of adaptation (new Figure 4C), and enabled us to more reliably estimate the relative contribution of different noise factors to pathway activity fluctuations in these cells (new Figure 4D). We have clarified the terminology in the figure legend. We removed confusing mentions of “rescaling” (which meant multiplication by a frequency-independent factor) by introducing the dissipation GR, which naturally appears in the FDT, and of “adjustment”, meaning a fit, which do not appear anymore in our revised treatment of the FDT. The response function in CheRB+ cells is now fitted instead (in Figure 4—figure supplement 5) to estimate the adaptation time. We have also merged the two data sets in Figure 4C (these were data for cells expressing Tar in two different initial modification states, which give essentially identical results in the presence of the adaptation enzymes, and which we decided to consider together to improve statistics). These two data sets were also presented in the former Figure 1C, D. One of them was moved to Figure 1—figure supplement 4 to improve readability of the manuscript, while the other remains in new Figure 1B, C.
In the theory section, the dynamic susceptibility \chi_A(\omega) was expressed in terms of the response of ΔcheRΔcheB strain to a step-like stimulus, which was measured in Figure 4A. More precisely we consider the Fourier transform of this function. We reformulated the theory development (now in the Appendix) to remove the confusing reference to an oscillating stimulus – which was meant to be the Fourier transform of the stimulus. We assume that the reviewer refers to the cheRB- case, where the system behaves as an equilibrium one, with Teff being close to T (blue curve in Figure 4D). In principle, we fully agree that for a perfectly measured equilibrium system Teff should simply equal T, and Teff/T = 1 over the entire frequency range. However, experimental measurements of Teff are typically imprecise, and the observed deviation from unity is within the range of data reported for other systems with similar precisions (e.g., refs Abou and Gallet PRL 2004, Wang, Song and Makse Nature Physics (2006), Martin et al. PNAS (2001)). We now explicitly discuss this issue in the text. To facilitate the comparison with ideal behavior, we now added a dashed line representing Teff = T in the inset of new Figure 4B, where these data are now presented. In contrast, for an out-of-equilibrium system, Teff may depend on omega, since the FDT breaks down only in a particular frequency range. This could be seen, for example, in the previous analysis of the inner ear hair bundle (ref Martin et al., PNAS (2001)). Notably, upon improving our analysis by using the measured rather than inferred response function for CheRB+ cells (see our fourth response to reviewer 1), the behavior of Teff for CheRB+ cells now actually resembles that reported by both Martin et al., PNAS (2001) and also predicted by Sartori and Tu, PRL (2015), turning negative when the active process (CheRB-dependent methylation in our case), which is a delayed – slow – negative feedback in all cases, overcomes the passive behavior of the system at low frequency, and remaining positive at higher frequencies. The frequency at which this occurs reflects this interplay between passive behavior and negative feedback. We now elaborate on the question of frequency dependence of Teff both in the main text (Results and Discussion) and in the Appendix, making comparisons to this and other previous works. As MWC is a mean field model, it doesn’t contain fluctuations, although it can be formulated to include a certain type of fluctuations as done now in the Appendix, in particular for simple simulations of the receptor clusters. In this case, only the signaling teams fluctuate as a whole, which neglect fluctuations of individual receptors and kinases, being therefore not very satisfactory. On the other hand, the Ising model naturally incorporates activity fluctuations in its formulation, and it was thus favored in our theory development. These differences are now plainly explained in the theory development. In general, we have now stronger focused the theory on the Ising model. The theory development was moved to Appendix and described more extensively. We apologize for not mentioning the study pointed out by the referee, it is now properly acknowledged and discussed in relation to our work. Again, we apologize for not being sufficiently clear in explaining the motivation for using the FDT and the interpretation of the results. Our prime reason to apply FDT was to understand the nature of fluctuations in cheRB- and CheRB+ cells, and thus the deviation from the FDT is actually informative. For cheRB- cells, our analysis showed that the FDT is satisfied, meaning that the system in this case behaves as in equilibrium. This was an important and absolutely non-trivial result. Even for CheRB+ cells, where the violation of the FDT was indeed theoretically predicted in Sartori and Tu, PRL (2015), application of the FDT-based analysis directly demonstrated this violation and showed that the system is out of equilibrium in a particular frequency range. The rational and the conclusions of the FDT application are now better spelled out in the Results and Discussion. Although the curve for the receptorless strain is mostly flat, as expected for a white shot noise, it does show a weak increase at low frequency as rightly pointed out by the Reviewer. We now additionally present YFP/CFP ratios measured with beads having a large fluorescence spectrum, for which bleaching is completely negligible, and which emit in both the YFP and CFP filter windows. This confirmed that instrumental noise results in pure white noise for the YFP/CFP ratio. The weak low frequency dependence might indeed come from photobleaching, although other phenomena like slow fluctuations in the cell state could also play an additional role, as now mentioned in the text. Irrespective of the precise origin of this deviation from the flat baseline, it makes only minor contribution to the PSD of strains with intermediate activity (one has to consider that all PSDs are plotted in log scale). To illustrate it, we now show the PSD curves for which the noise contribution was subtracted in new Figure 1—figure supplement 4 and Figure 2—figure supplement 1. Note that constant noise background is accounted for in the FDT formulation, as explicitly seen in Equation (2). These points are now discussed in Results and Materials and methods. We should have indeed mentioned this issue more explicitly. In all our experiments (except those in Figure 4—figure supplement 2 were Tar induction level was systematically varied), Tar was expressed at approximately 104 dimers per cell, which is similar to the total level of receptor expression in wild type. The level of Tar expression was previously mentioned but only when discussing theory development; we now explicitly state it at the beginning of the Results section. We believe that CheR and CheB are expressed at their native levels (few hundred copies per cell), including in CheW-Χ2 strains. Indeed in this strain, even CheW itself is expressed at the wild-type level (Pinas et al. PNAS (2016)), and we thus do not expect that this point mutation on a structural protein with no known gene regulatory function could affect the expression of genes expressed from a different operon. Thus the receptor is indeed in large excess relative to CheR, as it is in the wild-type cells, and therefore CheR is expected to work at saturation. We now clarify this point in the Results and Discussion. Part of the FDT formulation was moved to Appendix, as suggested. We have further extended the analysis and spelled out our motivation more clearly. Since the dynamics of the CheZ/CheYP cycle takes place on a time scale shorter than the second, below the time resolution of our measurements, it is not expected to contribute significantly to the observed noise. Consistent with that, no fluctuations above the shot noise background is experimentally observed at high frequencies. Moreover CheY and CheZ are abundant and not cooperative, we therefore expect they contribute very little as a noise source. We now discuss it during the theory development in Appendix and in Discussion. See our fourth response to reviewer 1. We apologize for not sufficiently elaborating on general motivation behind our study and on the significance of our findings, and we agree on importance of making our manuscript better accessible to scientists that are not well familiar with bacterial chemotaxis. The revised version of the manuscript addresses these issues, as well as giving more thorough clarification of the mutants and theoretical and experimental methodology. As mentioned above in our first response to reviewer 3, we revised the manuscript to give more details on the methodology, including details of FRET measurements and their interpretation. We have also performed additional control experiments, confirming that observed low-frequency fluctuations are indeed due to biology, and elaborated on the distinction between these biological fluctuations seen in certain strains and measurement noise that is present in all measured strains and under all conditions (see also our first response to reviewer 2). We now expanded the Results and Discussion to better discuss the FDT and significance of its application to the chemotaxis system, also in the context of published literature (also see our second and seventh and last responses to reviewer 1). We thank the Reviewer for acknowledging the novelty of our work and supporting its publication. We have now addressed remaining questions related to the FDT. Most importantly, we have shortened the FDT section and discussed the deviations from the FDT. Because the FDT is an integral component of the analysis that enabled us to decompose the two noise sources, importance of which is recognized by both reviewers, we felt that it is better to keep the essential part of the FDT analysis in the main text, to enable readers to follow the analysis. We agree that in the cheRB- strain, the deviation of the FDT ratio from unity is not negligible, and it might indicate contributions of out-of-equilibrium cellular processes to the receptor array stimulation. Nevertheless T/Teff ratio in this strain remains fairly close to unity, in contrast to T/Teff ratio in the CheRB+ strain that is far from unity and even negative over a part of the frequency spectrum. To emphasize this difference, we now set the insets of Figure 4B and C to the same scale, as also suggested by the reviewer. Thus thermal noise is clearly the main contributor to activity fluctuations in the cheRB- strain, despite possible second-order contributions from other sources. We modified Results (subsection “Fluctuation-dissipation relation for receptor clusters”, fourth paragraph) and Discussion (fifth paragraph) to clarify this point. The analytical model we used to describe the effect of the slow dynamics of receptor clusters is purely phenomenological, because there is currently no mechanistic explanation for slow cluster rearrangements in the cheRB- strains. The simulations thus included this slow dynamic in a very heuristic manner, meaning that agreement between simulations and experiments is only qualitative, as we already pointed out in the Results (subsection “Out-of-equilibrium dynamics in presence of adaptation system”, last paragraph) and the appendix (Appendix section 3 “Separating the contribution of methylation enzymes dynamics to the PSD in CheR+ CheB+ cells” and following). We now reemphasized these points in the Results (subsection “Fluctuation-dissipation relation for receptor clusters”, last paragraph) and Discussion (sixth paragraph). Furthermore such modeling would require knowledge of the dynamics of the fluctuations of the activity of the adaptation enzymes, which had not been previously described to our knowledge. We therefore preferred to analyze the activity fluctuations in terms of equilibrium and out-of-equilibrium components, as carried out in Figure 4D), to separate the contribution of thermally activated receptor noise and adaptation enzyme noise, and then infer the fluctuation dynamics of the methylation enzymes. Although we indeed did not expect the cooperative chemoreceptor cluster to have a build-in active system, it was not obvious and actually surprising to us that thermal fluctuations alone were enough to account for a large part of the observed fluctuations. As a matter of fact, our starting hypothesis was an involvement of some hypothetical non-equilibrium process in driving fluctuations in the cheRB- strain. This is now mentioned when justifying the application of the FDT in the Results (subsection “Fluctuation-dissipation relation for receptor clusters”, first paragraph). Thus, the finding that thermal noise could drive fluctuations of such magnitude, making a large part of the array to flip activity, is one of the main and most surprising results of this paper, and we re-emphasized it now in the Discussion (fifth paragraph). In the CheRB+ case, although it was indeed expected that FDT breaks down, the computations of fluctuation and response functions are however a necessary preliminary to the separation of noise sources. Therefore, the FDT analysis is a relevant part of this paper, which integrates into its narrative. We however shortened this part, by moving technicalities and less relevant information to supplementary (new Figure 4—figure supplement 8, parts moved from Results to Discussion, last paragraph and Appendix), in an effort to highlight the most relevant results. We rewrote the Abstract to emphasize the novelty of the manuscript. It was certainly not our intension to claim that our study is the first one to use fluctuation dissipation relations to infer properties of a biological system, and we therefore refer extensively to some of the most prominent previous work in the Introduction and Discussion section. However, there are important differences: Some of these previous works, from which we drew the methodology used in this work (primarily Martin et al), were investigating entirely different systems. Others (Korobkova et al., Park et al., Emonet and Cluzel) were interested in the chemotaxis pathway, but followed a different methodology and were interested in different quantities than the one we considered. We now discuss the results of previous studies and the relation between our and the previous works, also referring to Bialek et al. PNAS 2005, in greater detail in the Discussion (fourth and last paragraphs). As mentioned above, we however believe that the uncovering of noise sources and their relative importance yielded by the present FDT analysis is one of the novelties of our paper. The authors would like to thank R Somavanshi for assistance with experiments and NS Wingreen and SM Murray for comments on the manuscript. © 2017, Colin et al. Johannes M Keegstra et al. We present in vivo single-cell FRET measurements in the Escherichia coli chemotaxis system that reveal pervasive signaling variability, both across cells in isogenic populations and within individual cells over time. We quantify cell-to-cell variability of adaptation, ligand response, as well as steady-state output level, and analyze the role of network design in shaping this diversity from gene expression noise. In the absence of changes in gene expression, we find that single cells demonstrate strong temporal fluctuations. We provide evidence that such signaling noise can arise from at least two sources: (i) stochastic activities of adaptation enzymes, and (ii) receptor-kinase dynamics in the absence of adaptation. 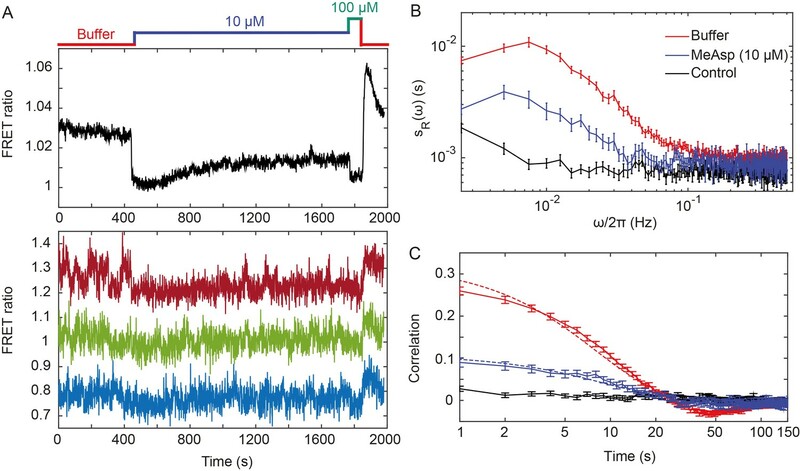 We demonstrate that under certain conditions, (ii) can generate giant fluctuations that drive signaling activity of the entire cell into a stochastic two-state switching regime. Our findings underscore the importance of molecular noise, arising not only in gene expression but also in protein networks.